Pneumonia is the first cause of death in children and elderly and diagnosis remains a challenge. The existing methods are either unreliable or too long. It generates many false positives and negatives or require 24 to 48 hours after which the patient’s life could be at risk. Alphasip, a Spanish SME, is validating a system that aims to deliver a diagnostic of pneumonia in 2 hours. In AlphaSIP’s system, thermal management to perform PCR heating and cooling cycles is a core subsystem. The subsystem delivered by IK4-Ikerlan consists of a miniaturized thermal management system, inclusive of detection, for the thermocycling has proven to be faster, reliable and affordable. The Gateone-project is part of SAE initiative and acts here as an Accelerator, allowing a fast match from the existing capabilities and developments at IK4-Ikerlan, consisting in this case of a miniaturized thermocycler module, and the needs of the company. The investment decision process was fast and helped to close the gap between the existing device and the real application, funding the small adaptation required to enable a risk release with a series of tests performed by the company by its own expert in an open innovation framework. AlphaSIP’s plan is to enter the market with reliable and easily recognizable technologies that contain a substantial degree of innovation. For this reason, the first product will be a desktop device that has a very robust performance and that can be easily tailored for many indications, combined with a miniature and modular innovative thermocycler. This will be the company’s first step towards a smaller and faster system. The system will be sold with consumable cartridges at a target price of 20 to 30€ each. The product should hit the market in 2017 after covering the following step: Development, Industrialization, Preclinical tests and Clinical tests. It is estimated that PoC systems would increase the revenue of AlphaSIP by 2,25M€ over the 5 years after market entrance only in Pneumonia. Other indications are already being developed which could multiply this figure. The estimated entrance of a PoC system into market is expected in 2018-2019. Picture 1: Non-invasive prenatal diagnostics with absolutely no risk for the fetus. ANGELAB1 Instrument. This system will use a Lab-on-a-Chip to extract fetal DNA from the mother´s plasma based on differences in Methylation pattern between fetus and mother and captured by specific magnetophoresis, plus real time Polymerase Chain Reaction (qPCR) for monogenic diseases with a known mutation for: Spinal Muscular Atrophy, Cystic Fibrosis (CF), and X-linked disorders. It will be used only for high risk population. ANGELAB2 Instrument. It will use a Lab-on-a-Chip to carry out methylated DNA immunoprecipitation (MeDIP) for fetal DNA extraction from mother´s blood and qPCR for Aneuploidies of chromosomes 13, 18, 21, X and Y. It will initially be used to screen high-risk pregnancies and later for population screening. ANGELAB3 Instrument. 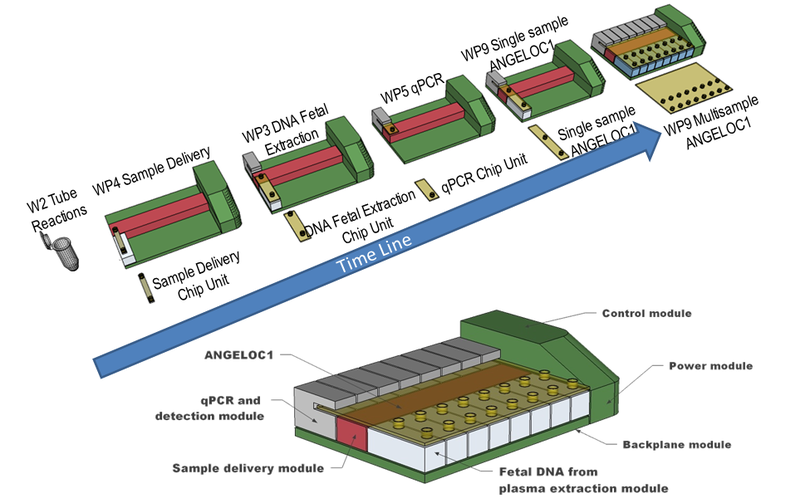 This system will use the DNA sample provided from ANGELAB1 or ANGELAB2 and it will carry out digital PCR on a Lab-on-a-Chip to detect multiple mutations such as Cystic Fibrosis. It will be used for population screening purposes. LPPL: This pilot line setup will provide a sustainable and economic Lab-on-a-Chip manufacturing. Materials, processes, and their life cycle will be considered. The environmental assessment will be carried out following ISO 14044. Quality control tools will be integrated along the entire production chain of Lab-on-a-Chips. The LPPL is envisioned to serve as a platform for the manufacture of any polymer based Lab-on-a-Chips. This project will end with the implementation of these three diagnostic systems as pilot routines in two Hospitals through a technical validation of 400 pregnancies. This task dimension will allow us to validate the systems against CE mark standards (ISO 15189:2007 and ISO 13485:2003) including the LPPL. In order to reduce health expenditure, the expensive gold standard is being substituted by a technique called Triple Screening (Biochemical tests and an Ecography) that advice whether or not to take the invasive test. Disadvantages: (i) Still expensive by itself (€160); (ii) If positive it still demands an invasive test; (iii) Very important false positive rate (83%) in order to guarantee low false negative rate (17%). There are recent non-invasive techniques to detect prenatal genetic disorders based on fetal free DNA in mother´s blood. These novel techniques are only used for selected clinical applications in research/expert centres due to their complexity and cost for the extraction and detection. 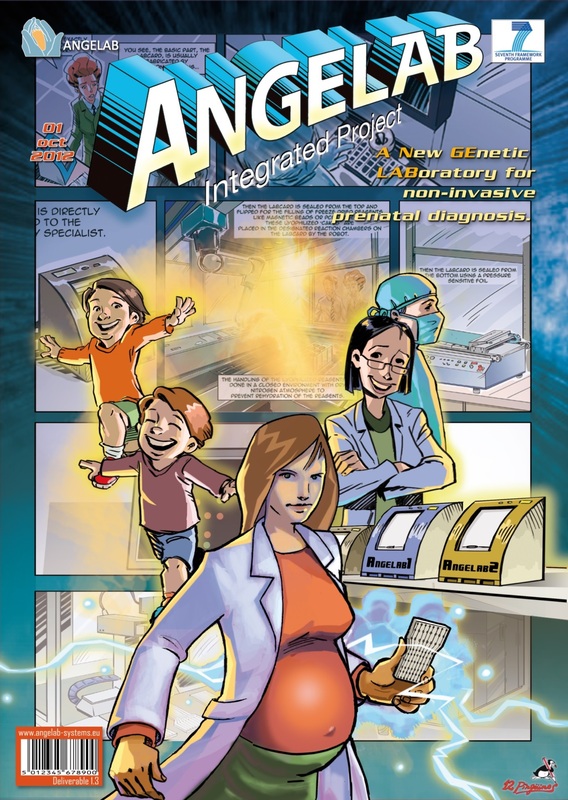 Therefore, the main impact of ANGELAB main impact is the future substitution of conventional a very risky invasive procedures that put the fetus at risk with an automated, fast, simple and accurate non-invasive prenatal diagnostic test that uses a blood sample from the mother and has absolutely no risk for the fetus. Basically, we will offer certainties without health risk. The European project was led by IK4-IKERLAN, with a consortium consisting of 15 partners from 7 different countries and a budget of 11 million, funded in part by the European Union through the Seventh Framework Program. Millions of people worldwide take Vitamin-K-Antagonists (VKA) for conditions such as atrial fibrillation, mechanical heart valve replacement or due to a high risk of thromboembolism. Vitamin-K-Antagonists are oral anticoagulants, also known with the commercial names, such as Marcumar and Warfarin. These drugs are used to prevent the development of blood clots. To best monitor the efficacy of VKAs, the prothrombin time PT (INR) needs to be frequently measured. The CoaguChek® product family (see Figure 1) is designed for the determination of prothrombin time (PT) and activated partial thromboplastin time (aPTT, only with CoaguChek® Pro II system) in typical Point-of-Care settings, such as hospital point of care, alternate site testing (ambulatory care), and patient self-testing (home). Since 1993, CoaguChek® systems from Roche have set the standard in Point-of-Care INR testing for patients on oral anticoagulant therapy–giving clinicians confidence in making critical treatment decisions. The CoaguChek® XS system and its successor CoaguChek® INRange system are used for patient self-testing (lay use), the CoaguChek® XS Plus system, the CoaguChek® XS Pro system, and the CoaguChek® Pro II system are designed for professional testing in physician office labs or hospitals (see Figure 2). From now on, we will focus on the CoaguChek® INRange system as it is the new standard of care for patients taking VKA / oral anticoagulation therapy as it enables patients to self-test their PT/INR at home or wherever they happen to be. It is suitable for properly selected and appropriately trained VKA patients and their caregivers. The CoaguChek® INRange system set consists of the instrument, disposable test strips, control materials and a lancing system (see Figure 3a and 3b). Instead of detecting the clot by mechanical or optical methods, the CoaguChek® INRange system monitors the activity of thrombin, the final protease for both plasmatic coagulation pathways. These measured INR-values are comparable to laboratory INR-values1. Furthermore, the system offers information such as trending reports, comments and color coded graphs, via with patients can quickly see their results. The meter enables patients to track their time in range by graphically displaying how many times they have been within, above or below their target therapeutic range (see Figure 4). Up to six comments with each result can be entered which help the patients to remember what is happening in their life that may have affected the results. Furthermore, reminders can be set directly on the meter for when to test or take medication. The PT test strip contains two reagents in dried form: Human recombinant Tissue Factor, also known as thromboplastin to start the extrinsic coagulation cascade and a peptide substrate Electrozym to generate the electrochemical detection signal. When the patient blood reaches the reagent zone on the test strip, FVIII from the sample binds to tissue factor and starts the coagulation process until the formation of thrombin. Thrombin reacts with the Electrozym substrate, resulting in the release of Phenylenediamine. Phenylenediamine is further oxidized at the working electrode, resulting in a current. 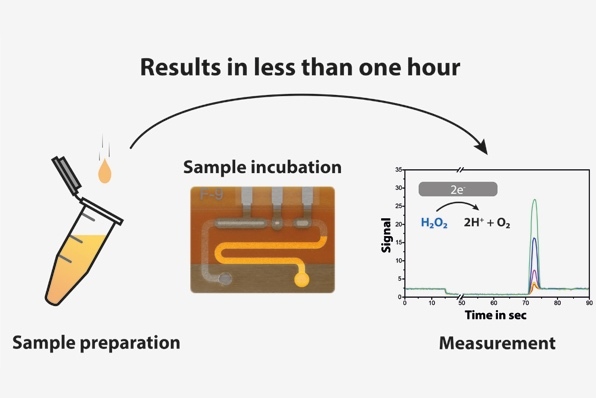 The time between the wetting of the reagents with sample and the raise in current, due to Phenylenediamine formation is measured and converted by calibration to INR values. The CoaguChek® Softclix lancing system and matching lancets allow virtually pain-free blood sampling from your fingertip. It is handy, hygienic and safe (thanks to minimal post-test bleeding). It delivers precisely the amount of blood required without any need for venous puncture. Frequent testing leads to fewer life threatening events3, 4, and increases your quality of life5. Patients: Being able to accurately monitor their coagulation status anywhere, yet remaining connected to a healthcare professional means convenience, freedom and peace of mind for people taking anticoagulants. Patients are also more likely to become better informed and knowledgeable about their PT/INR levels and treatment through regular testing. Healthcare professionals: Healthcare professionals can be confident that results are as reliable as from a laboratory. Detailed data patterns and trend reports can help to optimize treatment decisions in near real-time. Healthcare systems: Frequent monitoring helps reduce the risk of complications6, helping improve patients’ quality of life and health outcomes. The Roche CoaguChek® INRange system with Bluetooth technology sets a new standard of care in coagulation monitoring by enabling healthcare professionals to remotely monitor patient INR data in near-real time, while reducing visits to the lab. In-house development without external funding. Leichsenring, I. et al. (2005). AMHP: Results of master lot calibration of a new coagulation monitoring system for patient self-testing. J Thromb Haemost. 3, (SUPPL 1):P0884. Heneghan, C. et al. (2012). Self-monitoring of oral anticoagulation: systematic review and meta-analysis of individual patient data. Lancet 379 (9813), 322-334. Koertke, H., Koerfer, R.(2001). International normalized ratio self-management after mechanical heart calce replacement: is an early start advantageous? Ann Thorac Surg 72, 44-48. Bereznicki, L., et al. (2013). Supervised patient self-testing of warfarin therapy using an online system. J Med Internet Res 15, e138. Gallagher, A.M., et al. (2011). Risks of stroke and mortality associated with suboptimal anticoagulation in atrial fibrillation patients. Thromb Haemost 106, 968–977. Khan TI, Kamali F, Kesteven P, Avery P, Wynne H. The value of education and self-monitoring in the management of warfarin therapy in older patients with unstable control of anticoagulation. Br J Haematol. 2004;126(4):557-654. Wan, Y., et al. (2008). Anticoagulation control and prediction of adverse events in patients withatrial fibrillation: a systematic review. Circ Cardiovasc Qual Outcomes 1, 84–91. A cochlear implant is an established, effective and long-term solution for people with moderate to profound hearing loss. 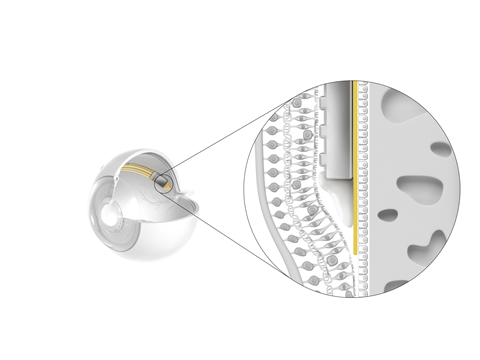 Cochlear pioneered the implant technology and is still the world’s industry leader. Microphones on a sound processor pick up sound waves and the processor converts them into digital information. This information is transferred through the coil to the implant just under the skin. The implant sends electrical signals down the electrode into the cochlea. 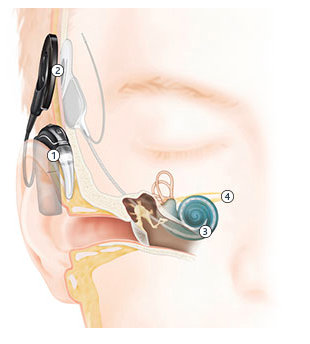 The hearing nerve fibres in the cochlea pick up the signals and send them to the brain, giving the sensation of sound. 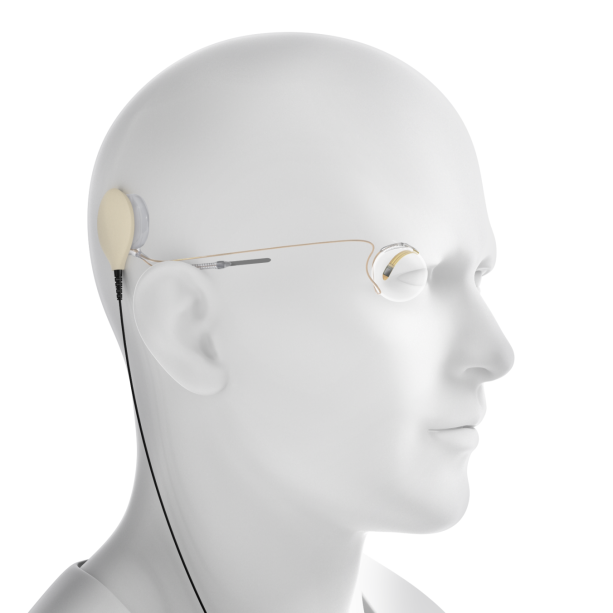 Cochlear implant technology is driven by small and low power ASICs, low power radio’s, improved rechargeable batteries, nano coatings, transcutaneous power link technologies and MEMS micro transducers. Studies have shown that adults with cochlear implants understand sentences on average almost seven times better than they could with hearing aids. Then there are the other improvements. In a US survey of 900 cochlear implant users, most respondents said they could effectively communicate over the phone and enjoy listening to music with their cochlear implant. With all these benefits, why wait? Nearly 80% of people who received a cochlear implant within a year of finding out they were candidates said they would get a cochlear implant sooner if they could do it again. Freeze drying is the most gentle method to conserve materials. Nowadays, these drying processes in industrial equipment are operated based on experience plus a safety margin. They could be performed far more time and energy efficient by using real-time-monitoring of humidity. However, no adequate sensor system is available on the market. Within the Smarter-SI project as part of the European Smart Anything Everywhere Initiative, a new type of sensor system integrating leading-edge technology has been manufactured. This system enables the exact determination of the dew-point in extremely low humidity environment. This in turn will allow the use of a “dead point” method in order to perform freeze drying processes far more effective. Depending on the actual process parameters some 20% of energy can be saved during the drying process. The project partners of Smarter-SI could provide all necessary technologies and building blocks to realise this innovative sensor system with the desired TRL. A temperature measurement diode (building block by CiS), an integrated Peltier-cooler (building block by IPHT) and sensitive thermo-electrical layers (building block by Hahn-Schickard) in a common Silicon wafer processing sequence are integrated into one sensor chip which includes all necessary functions to determine absolute humidity at extremely low temperatures (about -60°CTd). 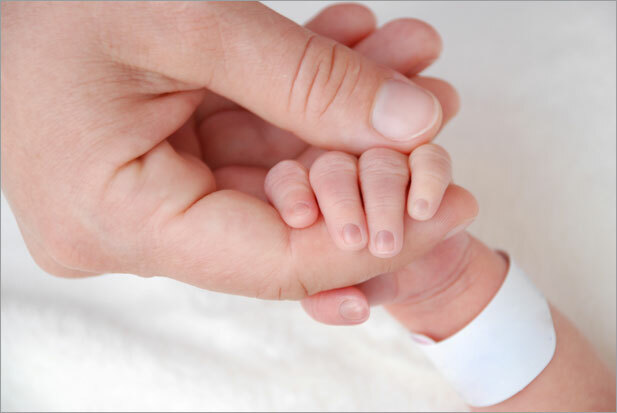 Partner Swerea IVF provides the necessary testing facilities (Swerea IVF). A world-first solution is the micromechanical integration of a Peltier-cooler in the sensitive part of the Silicon chip that creates a cooling cascade together with a second external Peltier-element. The know-how regarding the needed building blocks and the technology for the manufacturing of the sensor system is distributed among different RTOs and SMEs in Europe. The Innovation Action Smarter-SI brought these partners together, organised their cooperation along a distributed manufacturing chain and will exploit the results by manufacturing these sensor systems after the completion of the project. Commercial foundries manufacturing MEMS sensors or smart systems might also have all necessary technologies, but the small lot sizes needed by SMEs impede a commercially successful collaboration. SMEs in Europe get an easier access to Smart Systems Integration technologies by the cooperative foundry formed by the Smarter-SI partners. 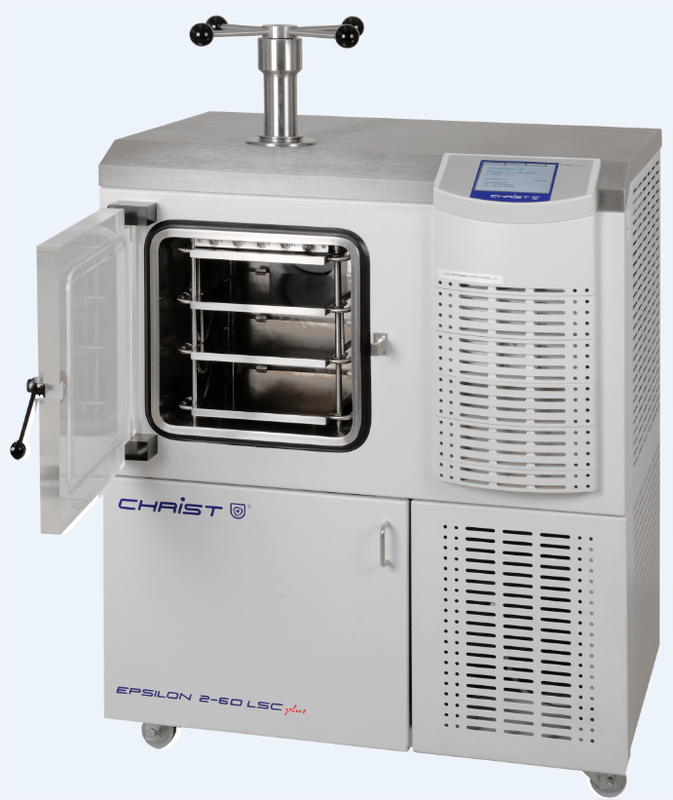 Martin Christ, a global leader in development and production of freeze drying equipment, will use the dew-point monitoring system in pilot-equipment first (around 100 items) to further test and improve robustness of the system. From 2017 on the optimised systems will be marketed worldwide. This will strengthen the position of the company Martin Christ, as they will be are the front-runner in the freeze drying market. It is estimated that this will increase the revenues of Martin Christ by more than one million Euros over the next five years. Additionally, the results of the project will be exploited in another attractive market segment: The SME TechnoLab, a service provider in the field of environment analytics and simulation, plans to enhance their business activities with calibration services of parameters such as humidity, temperature and gas concentrations. They will implement the new sensor systems in their mobile calibration units leading to estimated revenues of several hundred thousand Euros during the first five years period. 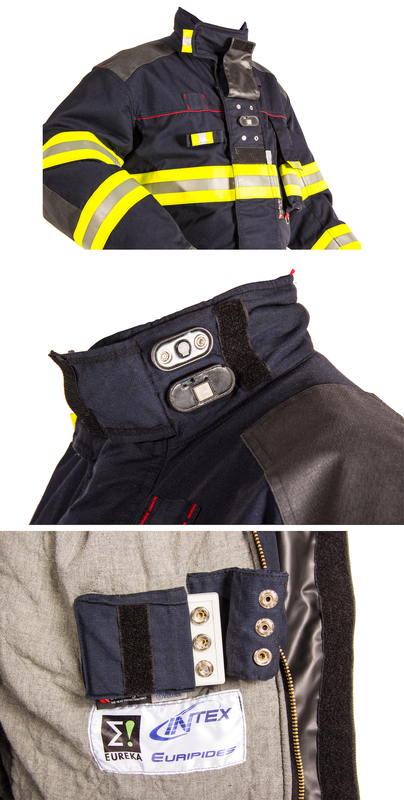 Smart jacket developed to help firefighters stay safer on the job! From watches monitoring heartbeats to contact lenses measuring blood sugar levels, wearable technology is taking off. And if you thought all the innovation was coming out of Silicon Valley, think again. In the small Czech town of Blatna, 100 kilometres South-West of Prague, electronics company Tesla Blatna created a breaking new jacket to protect firefighters. "Smart clothes like vests have been developed for military uses in the past. But all emergency workers also need real-time information to help them stay alive," said Dr Radek Soukup, of the University of West Bohemia in Pilsen, in the Czech Republic, who worked on the project. Fire crews in the Czech towns Pilsen and Zbiroh told the partners what they wanted from their high-tech jacket. 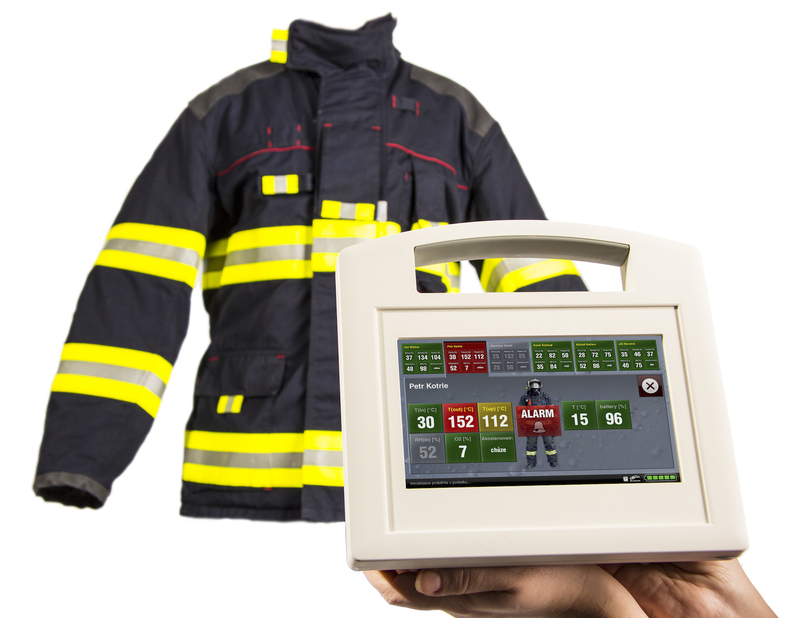 It should resist heat of more than 180 degrees for five minutes, measure heat and toxic gases, monitor the firemen’s body conditions and send information to headquarters automatically, activating alarms if they were in danger. The partners put antennas inside the suits to give them radio connection and printed super-thin materials containing conductive material to allow data to be transmitted and stored for later analysis. 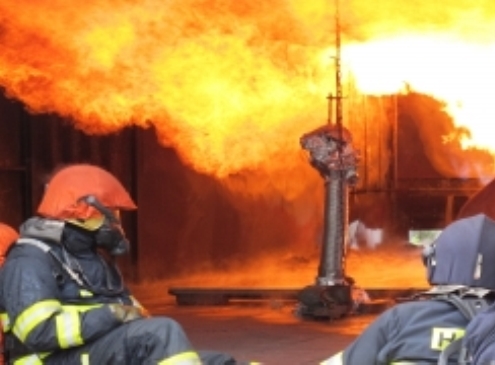 Once the firefighters were impressed, the partners made the prototype public by presenting it in trade shows, and they will now introduce it to Belgian authorities, which want smart suits for all fire crews in the country. The extreme innovativeness of the intelligent jacket explains that the partners are still awaiting European regulation to allow them to commercialise their emergency workers suits. While the adoption of the new tech by public authorities is an essential step in the way of mass commercialisation, in the meantime, the smart textile methods the partners in the project have developed might become widely applied to other economical sectors. "This could really help the renaissance of the textile industry in Europe," said Dr Soukup. "Jeans and T-shirts are now being made in South Asia and that is not going to change. But smart textiles are value-added and that's where the future lies." The company Tesla Blatna employs 420 people, far fewer than Google, but thinks big. It aims to commercialise the jacket developed during the European research project EURIPIDES INTEX. Other products will follow from the technologies developed during the project, which acronym stands for intelligent, sensing and communicating textile. Those will help the companies involved tap a wearable technology market expected to hit €6 billion by 2018, according to one estimate. Tesla Blatna, maker of electronic components for companies like carmaker Skoda, is the first company from one of the countries having accessed the EU in 2004 to lead a European-wide EURIPIDES project. It worked with a Czech university and French laboratory researchers from CEA Leti, with France's Polytrame, Germany's KIWO and Swiss BOPP, who all brought essential experience and technical skills. The Swiss SME greenTEG develops, manufactures and markets heat flux sensors for applications in research and development, building physics and laser beam characterization. The thermal laser power sensors are integrated into laser systems in materials processing, medical technology and scientific setups. The products are optimized for OEM integration into systems and are used to detect laser power and laser beam position at various power levels. With its existing technologies and products, the SME can play a major role in the continuously growing market of fiber lasers. As greenTEG is specialized in OEM component design, the company needed additional competences for moving their products from applications in free-space optics to the fiber laser market – this was the challenge to be solved with the support of the gateone-project. For successfully entering the optical fiber market, greenTEG had to develop components that are compatible with the fiber optics approach in a “plug and play” design. Through the gateone-project, CSEM, a Swiss research organization (RTO) focusing on electronics and microtechnology, helped the SME by adaption and implementation of CSEMs advanced photonics packaging technology. This way the RTO enabled a cost-effective, fiber coupled detector with a high resistivity against environmental influences. Unmatched performance is achieved in wavelength coverage from UV (400 nm) to MIR (2200 nm), mainly limited by the attenuation of the silica fiber used, for optical signals up to 500 mW and a resolution in the sub mW range. With the photonic packaging technology, greenTEG will target new markets with a widespread range of applications, most notably fiber-coupled laser systems with wavelengths in the mid-infrared range. The SME has already received very positive customer feedback and has won Thorlabs as exclusive integrator and distributor of their components. 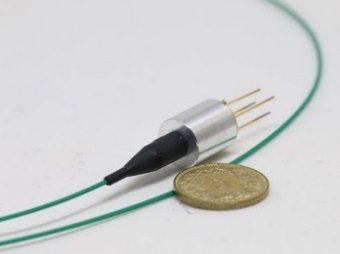 greenTEG presented their pigtail laser power sensor during Photonics West. The demonstrator was further displayed during the Laser World of Photonics China in March 2017 in Shanghai and the Laser World of Photonics Munich in June 2017. Absorption spectroscopy is used in a variety of sectors including within life science and drug discovery research. When the sample size is very small then the sensitivity of absorbance is low and fluorescence is more commonly used but this typically requires use of a label. The high sensitivity offered by the Cavity Enhanced Absorption Spectroscopy technique allows the use of absorbance over a far extended detection range. Absorbance can then be used in applications where only fluorescence could be previously considered and in a label free manner. The analysis becomes direct and the process speed is improved. BMG LABTECH has been committed to producing microplate readers for more than twenty years and has developed a wide range of dedicated and multi-mode microplate readers for life sciences applications and high-throughput screening.Thanks to the partnership between BMG Labtech and TEESSIDE University, the application of absorption spectroscopy can be pushed further and an extended field of applications will be within reach. This first version of the demonstrator works in the visible range and is currently under evaluation. It will be further explored in the UV range to address the market of DNA analysis. This new range of capability can enter seamlessly into BMG Labtech’s range of product. Please contact us for further information or for a demo. When patients are admitted to hospital it is of the utmost importance to monitor their vital signs with accuracy. The current solutions require multiple systems and it is not possible to monitor all hospitalized patients. Currently 10% of patients in the UK are harmed during their hospital visit and this represents an extra cost to cover the additional length of stay. Sensium Healthcare develops and sells a low cost wearable patch to monitor the vital signs which will enable early detection of sepsis, cardiac arrest and respiratory depression. However, realiable data requires a good interface between the body and the monitoring system, and therefore careful skin preparation is the key to acquiring quality data. Despite this, in many situations such as emergency admissions, the skin preparation guidelines are not adequately followed because it is time consuming and adds a burden to the clinical flow. Moreover, the silicone gel becomes progressively hard over time and the reliability of the electrode-skin interface deteriorates during long term monitoring. The Tyndall National Institute in Cork has developed a strong knowledge in the manufacturing of microneedles which has progressively evolved towards a proprietary process using a biocompatible polymer and metal coating. Those patches are painlessly applied without skin preparation and have already proven their potential to deliver accurate electrocardiography (ECG) measurements. The combination of TYNDALL’s technology with SENSIUM’s wearable patch was a perfect match between a problem and a potential solution. At this stage of the respective technologies of both partners, it was important to move to a clinical proof of concept demonstrator. 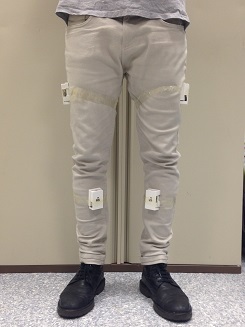 It was necessary to test these patches on real patients to record data under controlled conditions. The Gateone project was the perfect Open Innovation tool for this cross border experiment. The European funding was used by TYNDALL to pass the ethical clearances and deliver the probes in sufficient quantity and quality. SENSIUM invested resources and money to tailor their patch to accomodate the use of microneedles and recruited 12 patients on whom to perform the tests. The probes proved to work remarkably well and delivered very good ECG recordings without skin preparation. A future partnership will help to move to the production level of the patches and the production ecosystem is already known. Both parties are currently discussing the future steps required to reach the market at the end of 2018. Robots have been working in the industrial production for decades, however they have been doing this in an isolated environment with no humans around. In recent years, the field of collaborative robotics has gained a lot of traction and robots started working alongside their human coworkers. This change demands the robots to be aware of their surroundings in a much more comprehensive way. The Swiss SME F&P Robotics has been aware of this challenge in their customers’ industry and is producing intelligent robots which can safely collaborate with their coworkers in industries of food production and packaging as well as medical assistance. Through integrating flexible pressure sensors into their soft robots, they want to improve their products further. 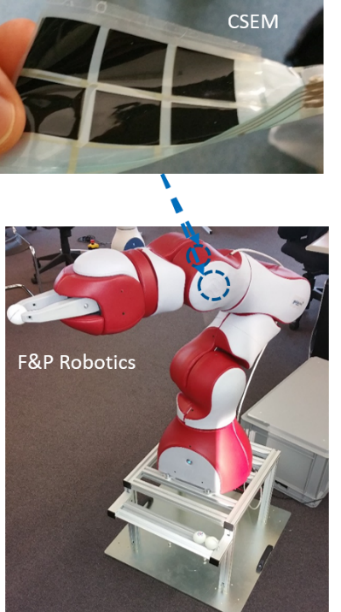 With the printed electronics platform developed by the research organization CSEM, F&P Robotics could implement an innovative hybrid integration approach for an artificial haptic experience based on a human-robot-interface. This allows a customized and cost effective solution combining printed pressure sensors and the robot hardware/software with a high integration factor. Thanks to the gateone-project, printed pressure sensors on flexible/stretchable foil were placed under the robot skin enabling the robot to “feel the environment” and to interact with humans once touched. The security feature, i.e. emergency function, was implemented whereas teaching/learning features are also enabled. This new domain of application has allowed an increase of maturity level of the technology from laboratory scale (TRL 4) to an industrial prototype scale (TRL 6). The technology demonstrated in the gateone-project will allow F&P Robotics to become a game changer in their industry by providing robots equipped with cost-effective and large area printed pressure sensors which add sensing functionalities, manipulating and correction capabilities to the robots. After a period of 6 months for the industrialization of the sensors, these demonstrators will open new market opportunities for the collaborative robot from F&P robotics, especially human environment and food handling segment. As one of its main challenges, the European Union is facing demographic change. Part of this development is caused by a continuously aging population. This trend implies different challenges, especially for the medical and healthcare sector. With rising age, the expectation of joint problems increases. Additionally, sports’ injuries generate different cases of arthroscopy as well. After surgeries, patients need to pass a rehabilitation process to strengthen muscles and regain their mobility. During this rehabilitation, patients have to exercise at home where they cannot be observed by medical staff. 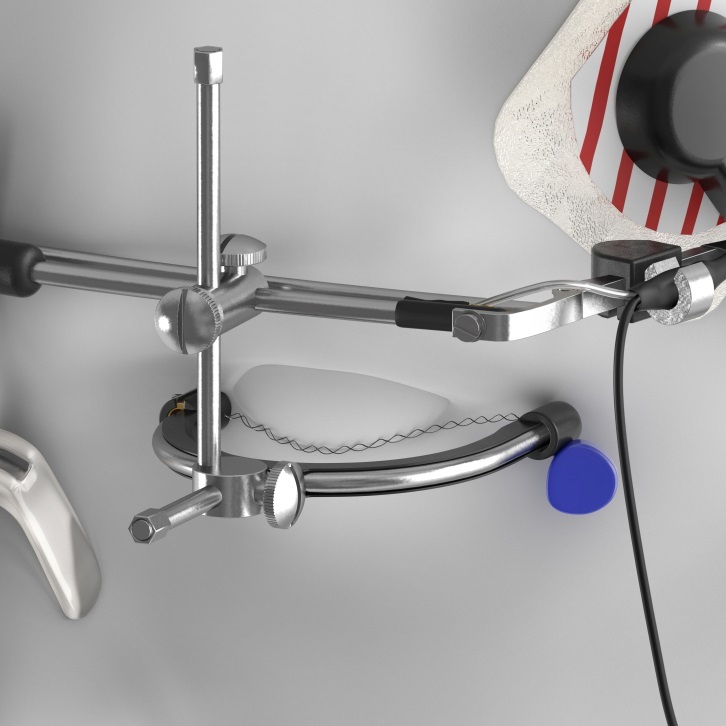 For monitoring the rehabilitation after knee arthroscopy, the German-Serbian software SME Nissatech Innovation Center developed a way to remotely monitor the progress. Based on the progress the patient makes, the rehabilitation program can be adapted and personalized. Together with the Irish research organization Tyndall, Nissatech encouraged the concept of a smart knee. The jointly developed demonstrator monitors the recovery after a knee arthroscopy. This is done by a knee movement sensor called SMART KNEE which monitors how successfully the patient has followed the instructions of the doctor. The generated data will be processed locally as well as globally to define the success of the whole rehabilitation process. Nissatech is a software company based both in Germany and Serbia with the software development team located in Serbia. They are a technology provider for mobile data processing, complex event processing (CEP) and real-time big data analytics. Being solely a software company, Nissatech relies on existing hardware to develop its service. There are, however, almost no open source products that deliver high quality data and access to the system for connectivity to the SaaS. The gateone-project provides a great opportunity for Nissatech to focus on one specific area and develop recurring revenue on their SaaS model. It also supports this transition from a sole R&D company to a commercial company. TYNDALL has developed a strong competency in the use Inertial Motion Units for gesture monitoring especially in Healthcare, sports and wellbeing. The research organization delivers an open source system that can be directly used by Nissatech. The demonstrator permits the company to sample products to develop its market. Budapest Hospital will be involved in the testing phase in order to start the validation approach. Providing software for the rehabilitation market is a service with low commercial competition for now. Fig. 1: Liver-Co-cultures in HepaChip®. Green fluorescent: Hepatozytes, red fluorescent: endothelial cells. The elongated structure with hepatocytes at the center and endothelial cells at the periphery resembles the smallest functional unit of the liver, the sinusoid. Cells are actively assembled by dielectrophoresis to settle on what is called “assembly ridges” within the cell chamber. There is a huge need for cell-based systems that model human organ function as closely as possible to avoid adverse drug effects such as liver toxicity. The new HepaChip®, developed by researchers at the NMI in Reutlingen on the basis of human liver and endothelial cells is able to do this. HepaChip® is a novel in vitro model of the liver in the industry standard wellplate format, comprising 24 cell culture chambers. Hepatocytes, endothelial cells and other cell types are arranged actively by means of dielectrophoretic forces within the cell chambers of HepaChip® to resemble the structure of the liver sinusoid. 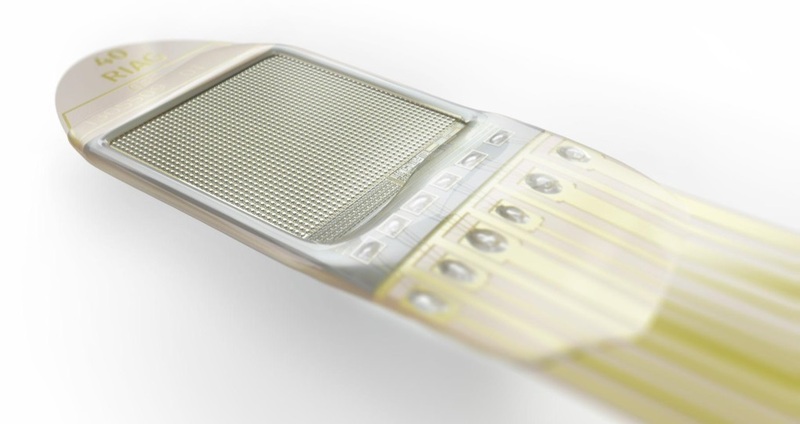 This aspect of the HepaChip® technology is unique and provides the additional advantage of seeding viable cells only. The HepaChip® employs microfluidic technology to enable continuous perfusion of the cell culture. 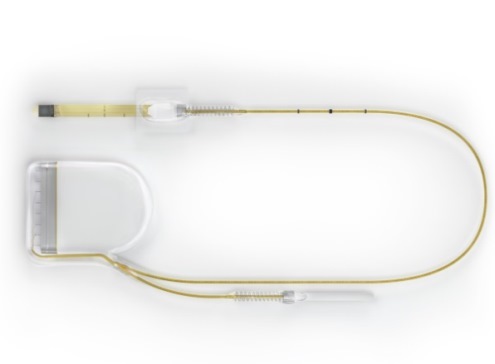 Fluid reservoirs mounted on top of the chip via industry standard Luer connectors enable perfusion by gravitational driven flow without the need for any tubing. A proprietory coating method allows for deposition of extracellular matrix protein on the assembly areas to enable cell adhesion by perfusion of the chip with a mixture of said protein and pluronic. Areas not intended for cell assembly are coated by a non-permissive layer of pluronic in the same process. Very low tendency towards unspecific binding even of very hydrophobic drugs to the polymer material was already demonstrated. Microinjection moulding provides a readily scalable, cost effective fabrication technology. A pipettor based periphery system and automated procedures for chip filling, cell assembly, and fluid exchange have been established. Fig. 2: HepaChip® - a microfluidic in vitro model of the liver in standard industry format, comprising 24 cell culture chambers and electrodes to actively assembly cells into sinusoid-like organoids by dielectrophoretic forces. Fig. 3: Enlarged view of individual cell culture area with fluid ports, cell chamber with elongated assembly ridges, electrodes used for dielectrophoretic assembly of cells and fluid resistor to control flow rate. Costs for drug development have increased dramatically. Failure of drugs in later stages of development i.e. during clinical trials result in huge financial losses. Early detection of insufficient efficacy and/or adverse side effects such as drug induced liver injury (DILI) therefore is of paramount importance and requires in vitro models with both significantly improved predictivity as well as applicability in conventional testing workflows. This is where HepaChip® is aiming at by adhering to industry standard design, parallelization, tubeless operation, organ-like morphology of cell cultures. 209577065.html). Market volume for 3D in vitro models for application in drug development and safety assessment was predicted to reach 3.9 billion US$ in 2019 at growth rates of 42% p.a. (Hunter, R. G. 3D Cell Cultures: Technologies and Global Markets; BIO140A; 2015). For tests concerning cytotoxicity and metabolism alone, a readily reachable market volume of more than 30 million US$ p.a. 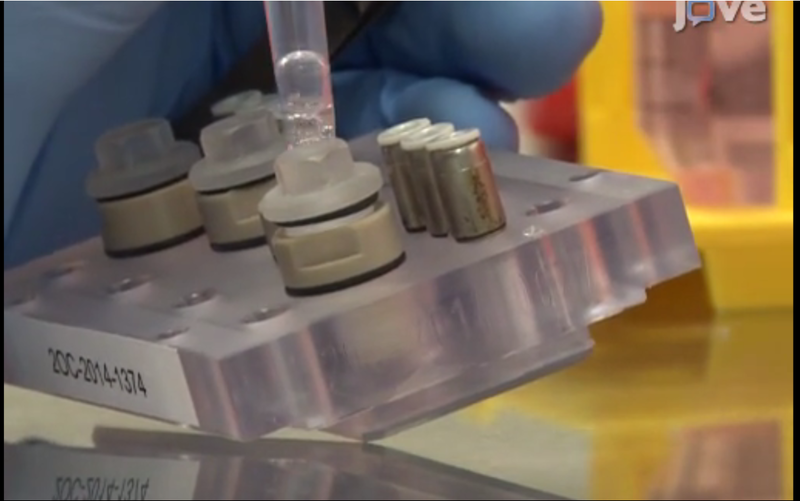 for a system like HepaChip® is anticipated from testing of new drug candidates. A multiple of this value is envisioned upon availability of a panel of organ-on-chip systems with the same chip format, interface, and periphery instrumentation. This could include models of the blood-brain-barrier, gut, kidney, brain as well as multi-organ chips. In addition, new market opportunities for HepaChip® may emerge in applications such as repeated dose toxicity assessment, personalised medicine, system biology research, and as a generic tool for organ-on-chip research. Funding of collaborative projects in part through grants from BMBF and Baden-Württemberg. Personalised drug therapy, adjusting the dose, dosage intervals, and the duration of treatment to fit individual patients' needs, are getting more and more important. Frequently, medications are dosed in such a way that each patient receives the same standardised amount of a certain drug. Thereby, clinical conditions of the patient, such as state of health, metabolism, or other physical factors, are often not sufficiently considered. A researcher team at the University of Freiburg has developed a bioanalytical method which can measure the class of β-lactam antibiotics in human blood on-site – in the operating room, intensive ward or doctor's office, as well as on a house call. iLab is our unique microfluidic biosensor platform for on-site testing, which combines electrochemical detection with microfluidic stop-flow protocols. Thus, it facilitates high-level miniaturisation along with increased sensitivity, fast detection and multiplexing, simultaneous detection of multiple analytes from a single sample, capability. 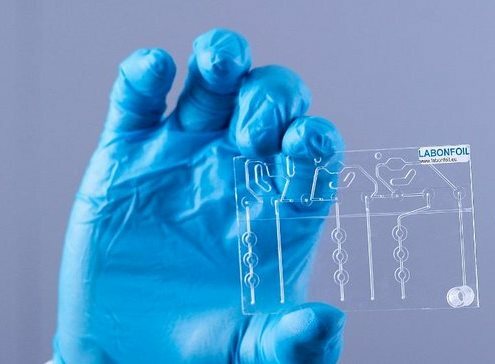 The flexible and disposable microfluidic chips are fabricated with the low-cost dry-film resist (DFR) technology. 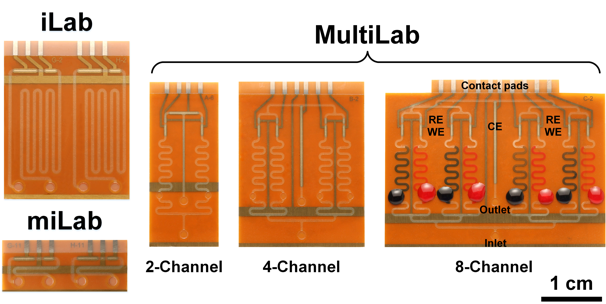 The iLab platform offers various biosensors, comprising a single electrochemical measurement cell along with a microfluidic channel or channel network of two, four or eight individual assay sections, each with a volume of less than one microliter. The driving concept of our system is the strict separation of biological section(s) for assay implementation and electrochemical cell by a hydrophobic barrier, as shown in figure 1. This prevents a possible electrode contamination with biomolecules and enables precise and easy metering of fluids only by capillarity. The signal readout of enzyme-linked bioassays, immobilised in the microfluidic channel or channel network, is achieved by the stop-flow technique. Here, the fluid flow is interrupted for a defined time, which leads to an increased concentration of the product of enzymatic reaction. By restarting the flow, this enhanced concentration profile is measured by the electrochemical cell. It results in a rectangular-like signal peak, where the maximum peak height remains constant down to a minimum length of the immobilisation capillary. This special feature enables a high-level miniaturisation of chip dimensions, while maintaining sensor sensitivity. The iLab platform covers different on-site applications ranging from environmental and food monitoring to medical diagnostics. However, our main focus lies on the multiplexed point-of-care testing (xPOCT), which is mainly driven by the arising medical demands, including personalised medicine (e.g., individualised drug therapy), homecare monitoring, wearables, and on-site diagnostics in resource-limited settings (e.g., infectious diseases in developing world). Low fabrication and running costs: The employed DFR technology allows a facile, low-cost and high-throughput fabrication. In addition, the use of microfluidics enables small sample and reagent consumption, low operating costs, and short turnaround times. Simplicity: As many commercial xPOCT devices lack of easy handling, we tried to keep each system component as simple as possible. The on-chip assay implementation is simply done by capillary forces, enabling to maintain the workflow of traditional immunoassays. High flexibility: We designed our platform as a plug-and-play system, employing a universally applicable assay realisation. In MultiLab chips, each immobilisation section within the channel network is actuated independently by individual inlets. This allows for the detection of numerous kinds of biomolecules, using different omics technologies (e.g., genomics and proteomics) or assay formats (e.g., competitive or sandwich). The estimation of the economic impact of our biosensor technology is particularly difficult, since it targets various on-site applications, including medical diagnostics, environmental and food monitoring. However, only focusing to point-of-care testing (POCT) gives a strong indication about its huge potential. According to a recent report of “MarketsandMarkets”, studying the global POCT market over the forecast period of 2016 to 2021, the market size will reach USD 40 Billion by 2021, at a compound annual growth rate of 9.8% over the whole period. This growth will be mainly driven by key factors including prevalence of lifestyle-related or infectious diseases, and emerging trends toward home healthcare. Depending on application area and intended time, there will be different socio-economic impacts of our technology. Its short-term effect would be for the on-site testing in developing countries, where high mortality rates from diseases, such as HIV and malaria, prevail due to poor medical infrastructure. On the other hand, in the industrial countries our approach could pave the way for home healthcare, allowing to perform diagnostic tests by caregivers or even by patient himself. Early and accurate diagnosis of a disease will not only improve the patient’s outcome, but also make a positive impact on the economy. The long-term effect of our approach could be, for example, the implementation of a wearable biosensor system capable of collecting body fluids, performing sample incubation and measurement automatically, analysing test results on-site, and transmitting them over internet. Currently, we own two German Research Foundation (DFG) grants (UR 70/12-1 and UR 70/10-1). Both projects aim at the simultaneous detection of various microRNAs as biomarkers for different diseases, including brain tumors or interstitial lung disease. 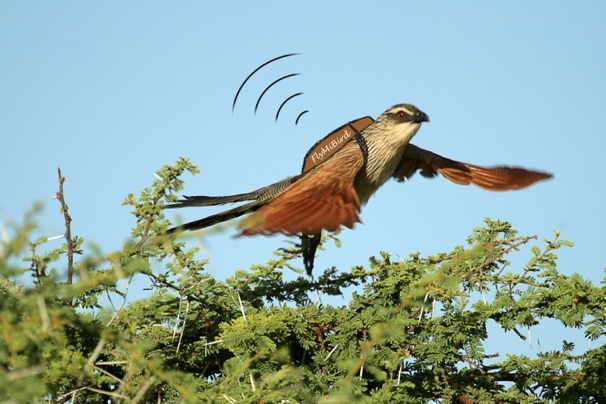 Besides, we have a Max Planck Society funded project “FlyMiBird” for the development of a microfluidic Lab-on-a-Bird transmitter for the hormone level monitoring of free-moving birds. Anti-Microbial Resistance (AMR) is a rising public health problem and has a direct impact on human and animal health and carries a heavy economic burden due to higher costs of treatments and reduced productivity caused by sickness. AMR is responsible for an estimated 25,000 deaths per year in the EU. It is also estimated that AMR costs the EU EUR 1.5 billion per year in healthcare costs and productivity losses. 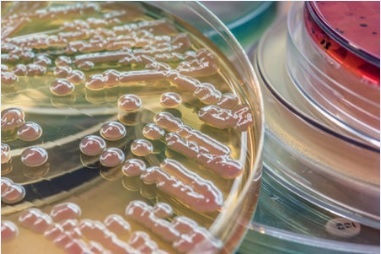 Diagnosing infections at early stage is key to overcome Anti-Microbial Resistance and requires new and efficient biosensors based on innovative technologies. These biosensors shall be able to perform reliable and highly sensitive biomarkers’ analysis in order to develop a competitive edge when addressing the vast market of molecular diagnostics. Shear Horizontal-Surface Acoustic Wave (SH-SAW) devices can operate in the presence of liquid with low acoustic losses. These systems have been used extensively as biosensors for the detection of various analytes in liquid, by monitoring rapid changes in both amplitude and phase. They allow detection of biomolecules in real time, label-free, are very sensitive and can be used for detection of viruses, bacteria and microbes. In a SH-SAW structure, its surface interaction with the liquid is observed by changes in the propagation constants of the acoustic wave. Low regeneration time of the bioactive surface. With decreasing costs and size, increased integration and targeting end-user requirements, the SH-SAW bio-sensor has the potential to provide new opportunities in addressing societal challenges (health), notably for SMEs, which will be able to increase their competitive advantage and gain new shares on the market. “SH-SAW bio-sensor for mass detection in liquid media, fabricated on LiTaO3 substrate“ Project funded by the Romanian National Authority for Scientific Research and Innovation-UEFISCDI. 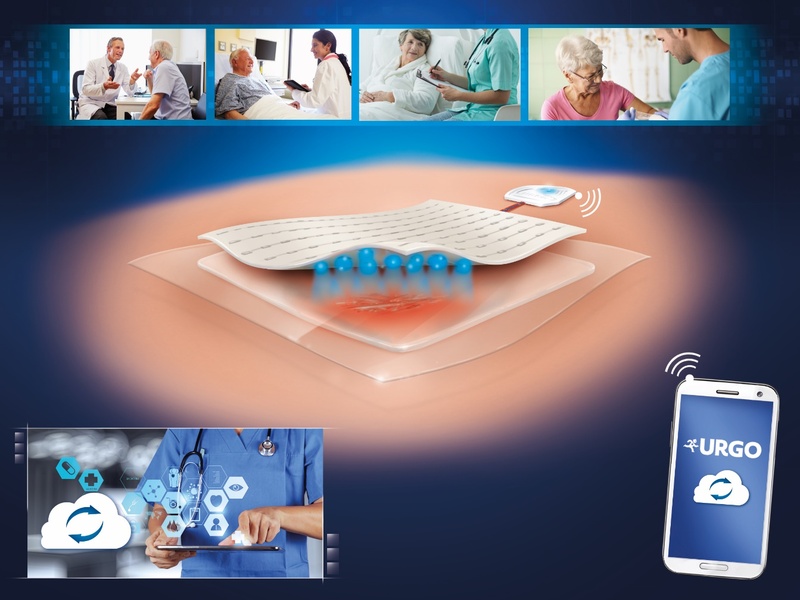 Labonfoil consists in a ground-breaking diagnostic system based on smart cards and skin patches combined with a portable reader. This small lab developed by European researchers can already detect cocaine consumption, monitor colon cancer, identify bacteria in food and analyse environmental contamination. Climate change: LabCard™ for marine algae analyisis, CO2 sequestration and toxic blooms. Food health: LabCard™ for Salmonella spp. and Campylobacter spp. detection in slaughter houses and farms. Colorectal cancer: LabCard™ for Colorectal Cancer monitoring using blood. Drug abuse: Skin patch for cocaine consumption testing of professional drivers. These all use a special, credit card-sized, plastic test unit -- a LabCard, which is pre-loaded with the appropriate reagents for the test required. The LabCard is made from injection moulded plastic with the appropriate reservoirs and valves as required for a particular specific analysis. A thin film of plastic is laminated on top to seal in the reagents and this is flexible enough to act as valves when moving the liquids though the various stages such as Polymerase Chain Reaction (PCR) to replicate and increase the DNA. The sample is sucked up into the supplied syringe where it mixes with the initial reagents and is then squirted into a reservoir on the LabCard™. 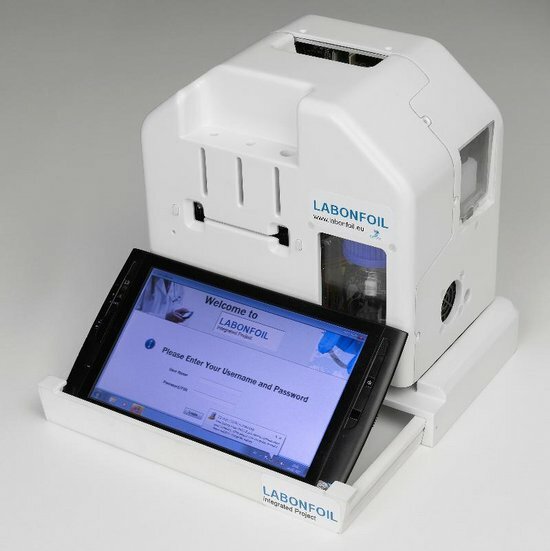 The LabCard™ is then inserted into a LabCardReader™ reader unit that automatically heats the LabCard™, and opens and closes the valves on it to move the test sample through the preparation stages. The last step is to detect fluorescence that indicates the presence of the target DNA which can be in concentrations at low as a few femtograms of DNA in 30 minutes. For some applications such as pathogen testing or in an Accident and Emergency Department being able to provide test result in 30 minutes rather than two days is one of the main advantages. Another advantage is the dramatic cost reduction based on the use of films and polymers instead of wafer substrate. The future mass production of these novel diagnostic components will be guaranteed by the development of manufacturing equipment. This will provide, in the end, a standardised solution to manufacture truly ultra-low-cost Lab-on-a-chip microsystems. 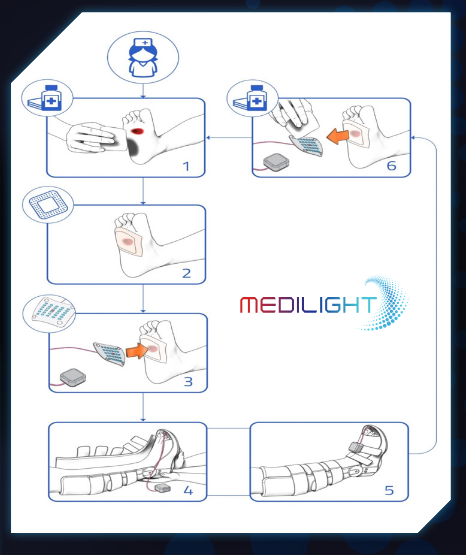 The MEDILIGHT system developed in the framework of the homonymous European project is a medical device which uses proven therapeutic effects of visible light to enhance the self-healing process and to monitor the status and history of the wound during therapy. Light exposure in the blue part of the spectrum (450–495nm) is known to have antibacterial effects predominantly at the surface layers of the skin. At certain conditions, blue light irradiations were found to also induce an accelerated cell growth of keratinocytes and fibroblasts. 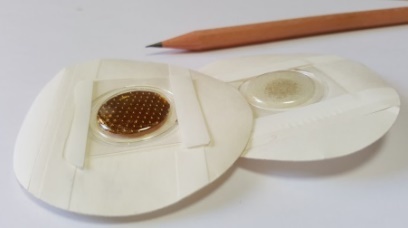 a disposable wound dressing with reusable LED illumination system and integrated sensors for measuring the temperature and the oxygenation of the wound placed on the top of the hermetically sealed wound dressing. a soft and compliant electronic module for multiple use containing all electronic parts, a microcontroller and wireless data transceiver for interaction with a smartphone/pda, and a rechargeable battery with battery status monitor (Figure 2). The status of the wound will be monitored with temporal and low level spatial resolution. The electronic module will be optimised for functionality and user comfort. The detailed effects of light-exposure schemes will be explored and backed by in-vitro and in-vivo studies. Results will be used to develop smart algorithms and implement it into respective programs and feedback loops of the device. Chronic wounds represent a significant burden to patients, health care professionals, and health care systems, affecting over 40 million patients and creating costs of approximately 40 billion € annually. Goal of the project is the fabrication of a medical device for professional wound care. The device will use recently proven therapeutic effects of visible light to enhance the self-healing process and monitor the status and history of the wound during therapy. Technische Universitaet Berlin (TUB), Germany; Urgo Research Development and Innovation, France; Ruprecht-Karls-Universitaet Heidelberg, Germany; Centre Suisse d’Electronique et de Microtechnique SA (CSEM), Switzerland; SignalGeneriX Ltd, Cyprus; Microsemi Semiconductor Limited, United Kingdom; and AMIRES s.r.o., Czech Republic. The consortium is supported by an important exploitation partner, French company URGO, which is a number 3 in Europe on the market in advance wound healing products (number 1 in Germany). URGO provides end user requirements and application cases and has already outlined a roadmap for a post-project further system development and commercialiation, which it will carry out. 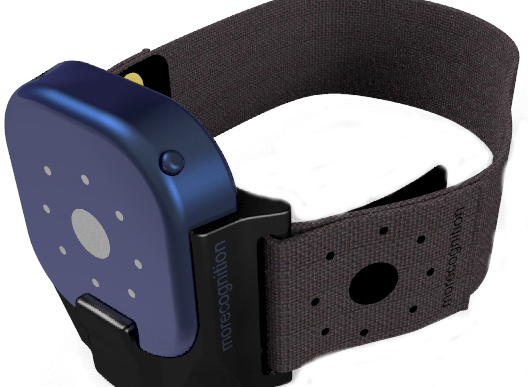 This project has received funding from the European Union’s Horizon 2020 research and innovation programme under grant agreement No 644267, project MEDILIGHT. The quality of food as part of our daily diet is becoming more and more important. Thanks to immune-enzymatic techniques it is possible to detect and even quantify a large number of substances of interest. 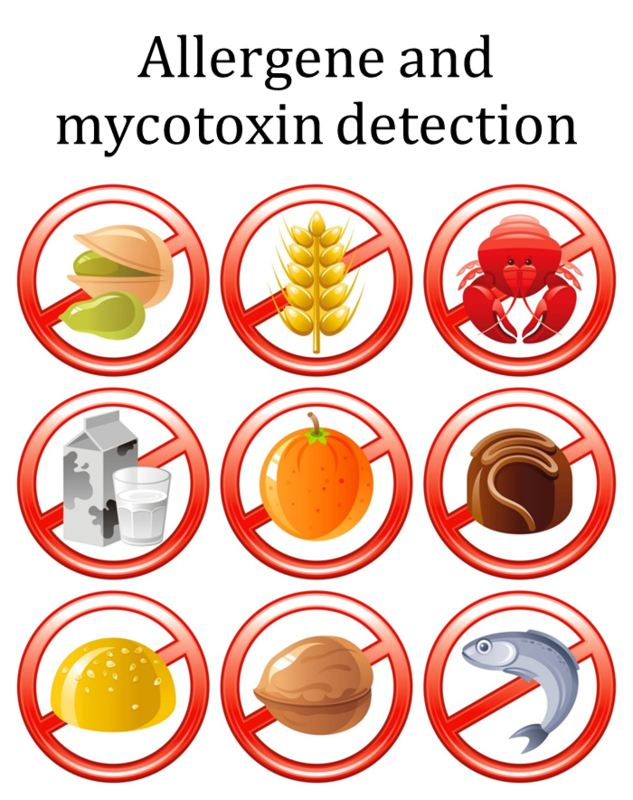 The current solution is provided by a set of individual kits, and the challenge is to have a multi-parametric device to detect a set of allergens and toxins in the analysed food product, in a friendly, automated and low cost way. This is what within Smarter-SI project is provided. 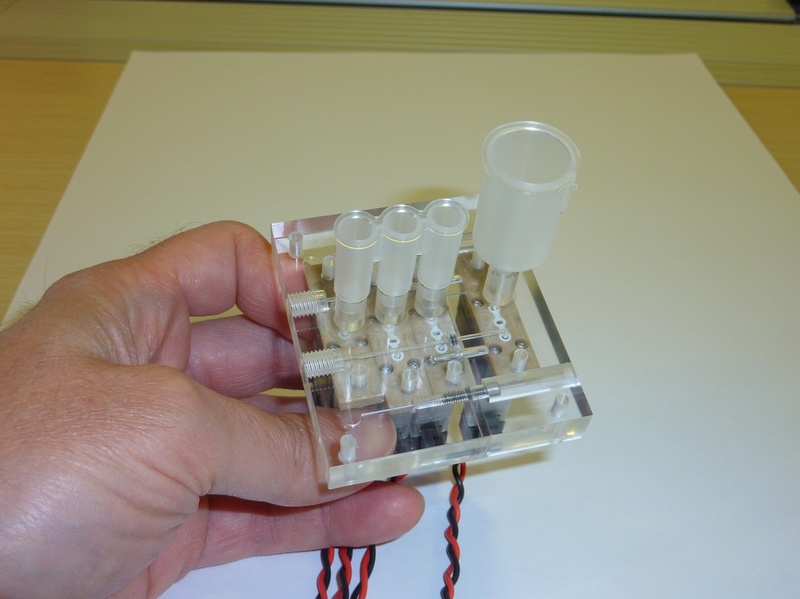 The system includes a microfluidic plastic cartridge and the fluidic distribution (building block provided by IK4-Ikerlan), a fluorescence reader (building block provided by CiS) and the embedded electronics (building block provided by Hahn-Schickard). The company Ingenasa, that is already very active in this market providing detection kits, will offer this platform together with their biological reagents as a new testing solution. The company microLIQUID is aiming to expand its micro-fluidic portfolio to new applications. 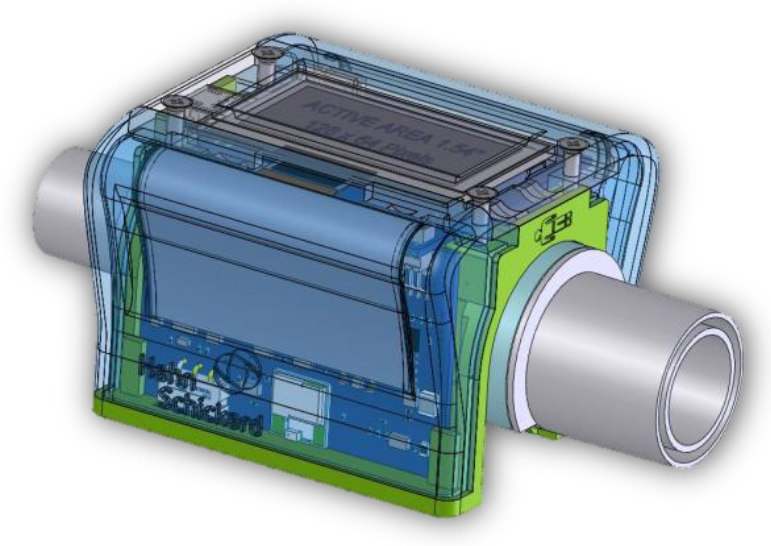 Smarter-SI as part of the SAE initiative, allows, through the cooperation of partners, bring together all necessary technologies and building blocks to end up with this innovative multi-parametric detection platform with a low cost disposable cartridge. The coordination and knowledge of existing advanced developments within the RTOs participating in the project has made it possible to combine required technologies and components in a fast and effective way. Complex systems that include several building blocks, as is this case, take the most advantage of this kind of initiative, not easy to accomplish by an individual technology provider. Ingenasa will commercialise this general multi-parametric detection platform, together with the products the company currently commercialise, what will impact, not only in food allergens market, but also in veterinary diagnosis, in which the main focus is in pets´ diagnosis. Thanks to the introduction of such a high level technologies, they will position the company in a privileged position within the fields of food safety and veterinary diagnosis, reinforcing and increasing their current market share and opening new business opportunities. Along 2017 a controlled introduction in test laboratories will be done to get their feedback and, later on, the optimized systems will be marketed, mainly at European level. It is estimated that this will increase the revenue of Ingenasa by 1 M€ over the next 5 years. The market perspectives are valid for the two companies Ingenasa and Microliquid, acting Microliquid as the main provider for Ingenasa. LABION has developed MNBS in the field of healthcare for research rehabilitation. In our lab we are working on a rehabilomic approach based on nanobiophotonic techniques to measure, in an objective way, the treatment efficacy. Our clinical case study is Multiple Sclerosis, it is currently very difficult to predict the evolution of the disease and make appropriate treatment decisions. Serum miRNAs are emerging potential biomarkers but there is currently no gold standard method of miRNA analysis. 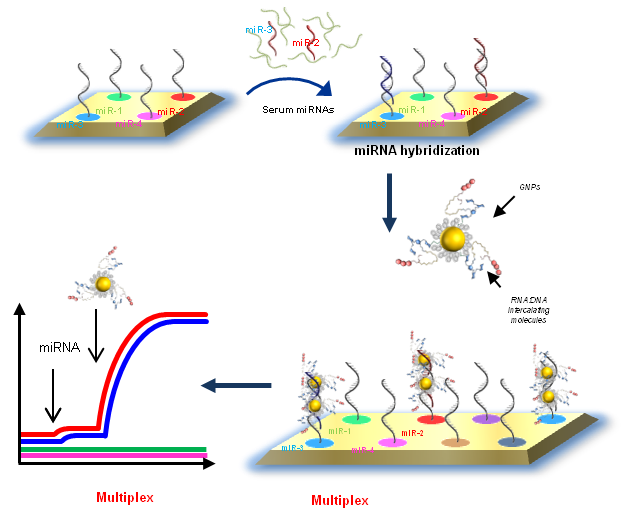 Therefore we propose to analyze multiple candidate predictive miRNAs (multiplexing approach) in a reliable and efficient way, PCR-free, by means a new nanotechnology-enhanced biosensor (substrate and gold nanoparticles (GNPs)) and an advanced optical detection technique (Surface Plasmon Resonance imaging). The nano-biosensor for SPRi multiplexing analysis of miRNAs is competitive comparing to conventional methods because of cost-effectiveness and accessibility. Mainly due to the simplicity of the analytical approach, negligible sample preparation, and few operator-dependent procedures as it does not involve modifying the original miRNA molecules (no labelling, amplification, elongation or retro-transcription). Imec has designed and fabricated a demonstrator of a neural probe with unprecedented electrode density. Designed and fabricated in silicon chip technology, the probe is suitable for breakthrough bio-interfaces and implants that will shape the future of neuroscience. With hundreds of electrodes capable of contacting and reading out single neurons, this probe incorporates innovations that point the way to a better understanding of the brain, and ultimately will lead to diagnostic and prosthetic tools to tackle human brain diseases. Imec’s NeuroSeeker probe has the size of a chip package and consists of a base chip and protruding needle. The needle is biocompatible and extremely thin (8mm long, 50µm thick, and 100μm wide), to reduce damage to the brain tissue. Along the needle’s shaft hundreds of electrodes are arranged, each a tiny square measuring 20x20µm2. 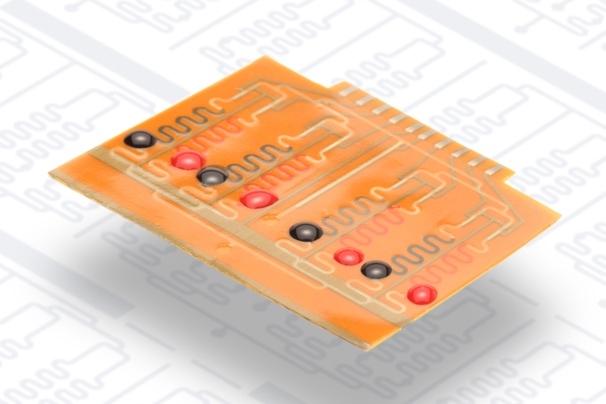 To allow for the dense layout of the electrodes and to be able to read out all electrodes simultaneously, the designers created an innovative time-division multiplexing scheme, which connects 8 electrodes through a single wire with the electronics in the base chip. The probe is expected to help neuroscientists gain a better insight in how the human brain works, hopefully leading to more accurate diagnostic and prosthetic tools to tackle human brain diseases. Reaching a new level of electrode density, the new probe aligns with the size and density of the brain network so it can measure what is going on in the brain or reversely, influence brain activity through electrical stimulation. The NeuroSeeker probe is an extreme prototype design case based on imec’s silicon design and fabrication platform. Other collaborations are ongoing for utilising design and platform capabilities e.g. for peripheral neuroprosthetic applications (towards use in humans as a medical device) and for establishing an internationally available and achievable neural probe platform for the neuroscience community (cfr collaboration with Howard Hughes Medical Institute, Allen Institute for Brain Science, Gatsby Charitable Foundation, Wellcome Trust, University College London). This showcase was in part developed and funded by the European Commission in the context of the FP7-ICT FET Proactive project “NeuroSeeker”, Project ID 600925 (2013-2017), website: http://www.neuroseeker.eu. The ambitious project was run by an international consortium of leading European and Canadian laboratories with expertise spanning the breath of brain research, from probe technology to theories of information representation. 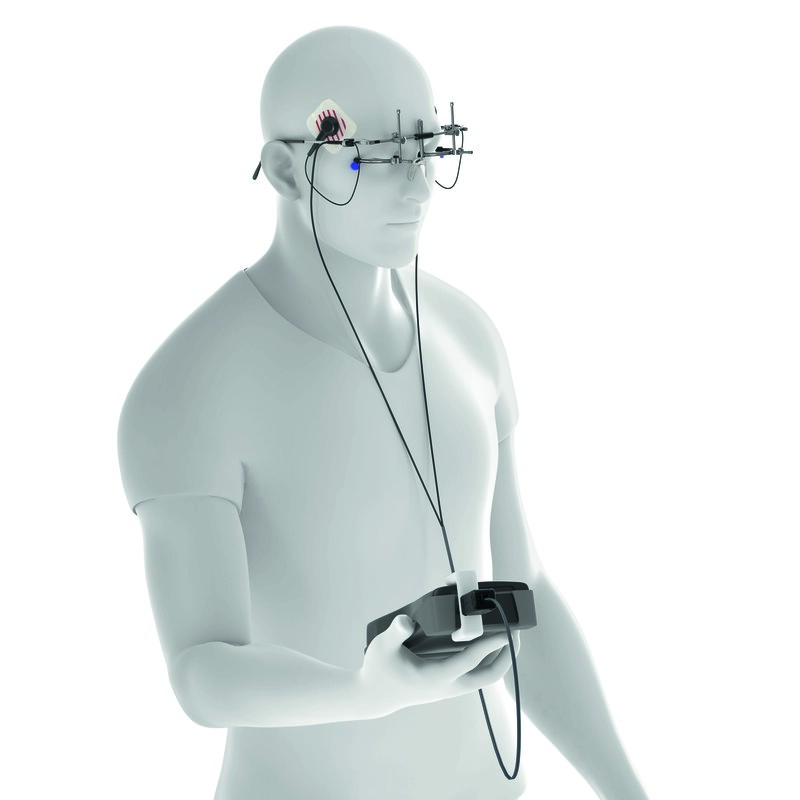 Pre-cursor R&D has been funded in part by the Flemish Government in the context of the IWT SBO project “BrainSTaR”, Project ID 090054 (2010-2013) in collaboration with other Flemish laboratories and industry partners, website: https://projects.imec.be/brainstar. Fig. 1. Block diagram of the SMART implant system with a wireless link between an external reader unit and the implanted electronic circuit with ASICs and sensorchip. Electrically active medical implants are used for the diagnosis, monitoring and treatment of numerous diseases. The best known are pacemakers, cochlear implants and deep brain stimulators for the treatment of Parkinson's disease. Currently there are numerous dysfunctions of internal organs in the focus of new therapy approaches. State-of-the-art active implants for long-term use basically consist of a solid metal housing protecting the electronics and the energy storage. For applications, where only a small volume is available for embedding of the implant into the body, and where large batteries and cabling are not applicable, miniaturized and compact system architectures are required. The devices must contain means for on-board data management and a wireless link with external devices for energy and data transmission. 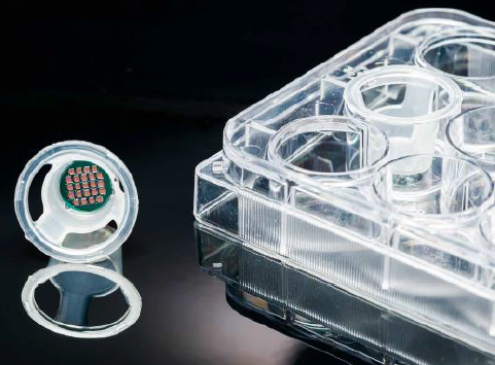 The SMART IMPLANT consortium in the Spitzencluster microTEC Südwest developed a highly-integrated system for in vivo biosensor applications. It contains amperometric, potentiometric and impedance sensors for measurement of the oxygen concentration, the pH value and the impedance in the immediate environment of the implant. The electronic circuits are designed for maximum energy efficiency to allow, together with the high integration density, as small as possible and wireless active implants. The implant system consists of a sensor capsule and an external control and reading unit (Fig. 1). ASICs (application specific integrated circuit) and a microcontroller enable the readout of sensors and inductive energy and bi-directional data transfer between the implant and an external unit via an inductive interface. 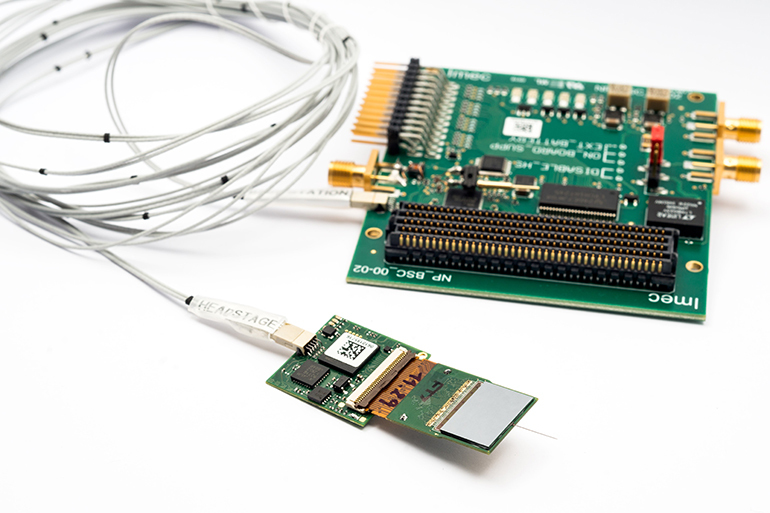 The link enables data rates of 50 kbit/s for parametrization of the implant, uplink transmission of the sensor measurement data and the realization of a closed loop power control. 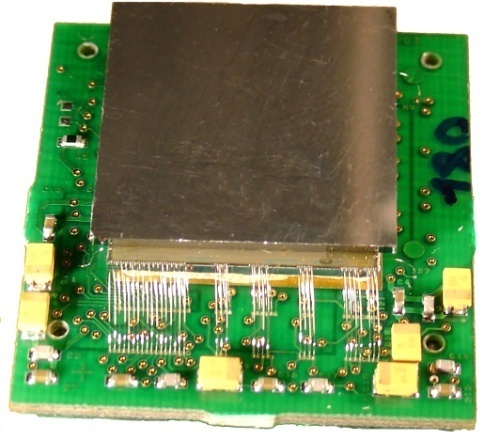 The electronic components (2 ASICs, microcontroller, SMD components) and a separately produced sensor chip are assembled on a 3-dimensionally shaped MID (molded interconnect device) board (Fig. 2). The board and a battery are housed for mechanical protection in a two-part, rigid capsule(Fig. 3) made of PEEK (polyetheretherketone). PEEK is suitable as a chemically resistant construction material. However, PEEK alone is not a sufficient barrier to water vapor and thus against moisture. 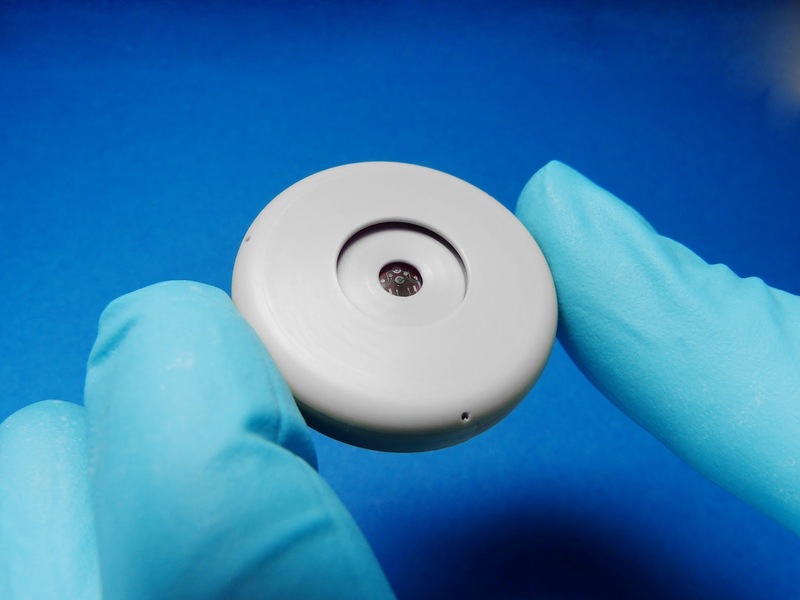 To protect the MID board with the electronic parts against ingress of moisture, it is coated before being integrated into the capsule with Parylene C. The rechargeable battery allows autonomous operation of the implant. Fig. 3. Implantable capsule for electrochemical biosensor applications. The sensors are located in the opening on the upper side of the PEEK housing. Depending on the parametrisation the microcontroller periodically wakes up the custom-made sensor readout ASIC which amplifies and digitizes the signals from the sensors and sends them back to the microcontroller, where they are stored in its internal memory. 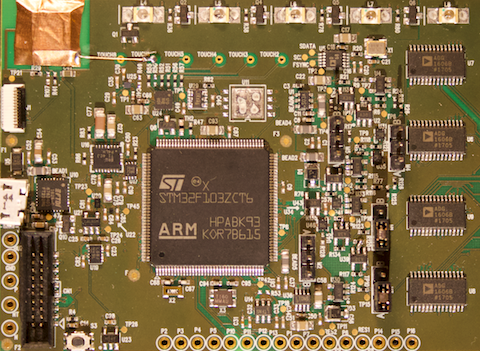 The connection to the microcontroller is established by a Serial Peripheral Interface (SPI) Bus. Biasing of the sensors is done by a digital to analogue converter (DAC) set by the microcontroller. The measurement circuits contain a charge integrator for current measurements and a high impedance amplifier for voltage measurement. All components are designed for low power operation, but still achieving an overall measurement rate of 1 kHz. 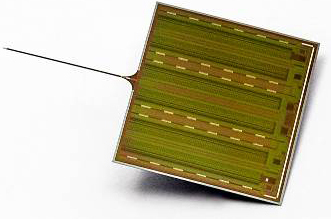 The sensor readout ASIC is produced at IMS using the in-house Gate Forest architecture with 0.5μm CMOS processes. 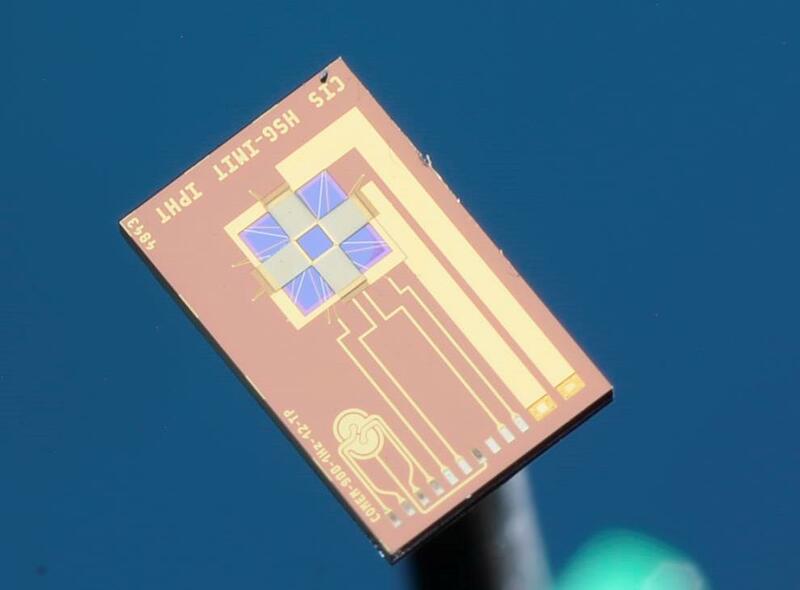 In the framework of this project 250 µm thick chips have been accommodated in a QFN48 (7x7mm) package. The microelectrodes for electrochemical monitoring are fabricated on a glass substrate by Ti/Pt sputtering and subsequent structuring of the connecting lanes and overlaying insulating layers (SiO2, SU-8 ) by means of photolithography and dry etching processes. Each micro sensor array comprises the setup for two O2-, two pH-value- and one impedance measurement. 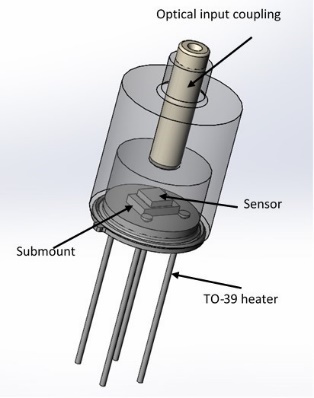 An amperometric sensor realized in a three electrode configuration with working, counter and reference electrode, is employed to measure oxygen concentration. A pH sensitive potentiometric sensor in a two electrode configuration comprising a working and reference electrode is fabricated by electroplating iridium dioxide and subsequent coating with a cation-selective polymer membrane (Nafion®). Amperometric and potentiometric sensors share a common on-chip reference electrode. This is realized as a quasi-reference electrode and fabricated by electroplating of Ag/AgCl. Impedance measurements as a parameter for tissue characterization are realized in a four electrode configuration with separated potential-pick up and current-carrying electrodes. 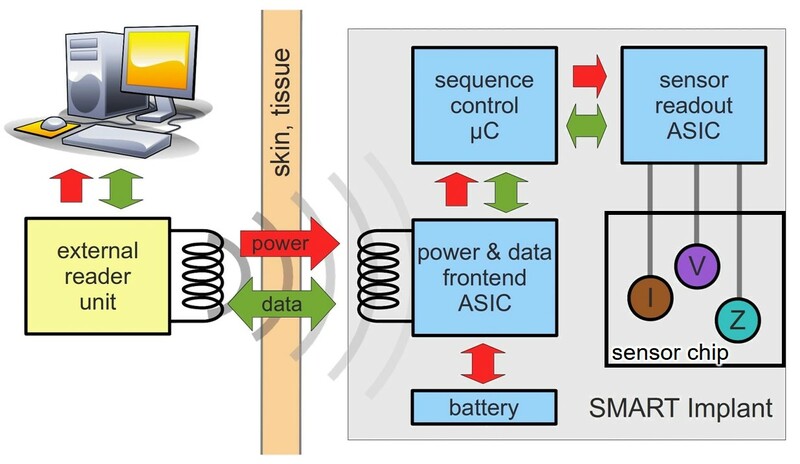 Implantable biosensors allow the continuous detection of biomarkers that can be used for diagnosis and monitoring of neurological, cardiovascular and metabolic diseases, to monitor drug effects and vitality of tissue and organs in intensive care after transplantation. 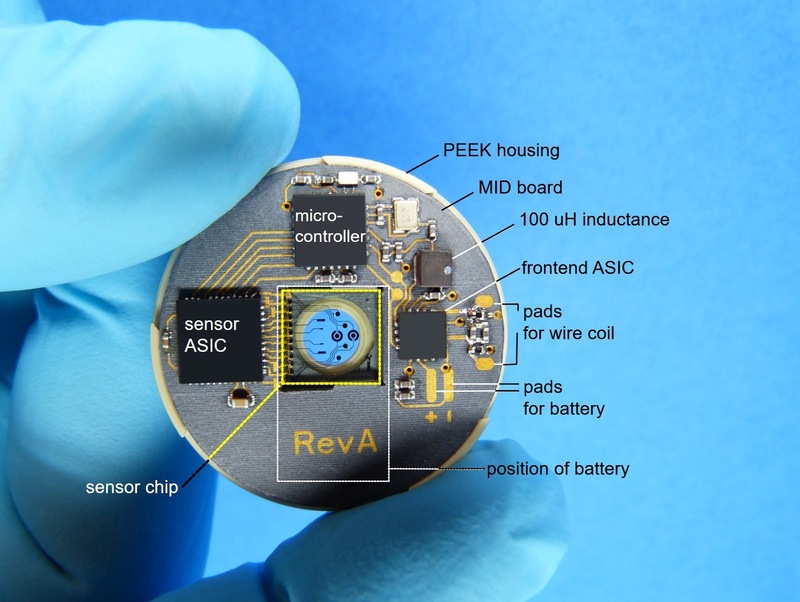 Miniaturization of active implants comprising high functionality and wireless links to external devices can be obtained by designing energy efficient electronic circuits and ASICs and their integration in compact substrates and housings. Those miniaturized implants will open up a whole new spectrum of health care applications, facilitating more specific diagnosis, more effective therapies and aids used on a daily basis by patients suffering e.g. from neurological or metabolic disorders. T. Lebold, M. Kokelmann, Retina Implant AG, Reutlingen. SMART IMPLANT was a project of the SSI platform in the Cluster microTEC Südwest, funded by the German Federal Ministry of Education and Research (BMBF), grants no. 16SV5979K, 16SV5980, 16SV5982-86. With actual spirometry systems the breath of a patient is not monitored directly at his mouth. The air needs to go through long tubes to a complex and relatively cost intensive apparatus that analyses the breath amount and frequency, but does not analyse the composition of the breathing gas. 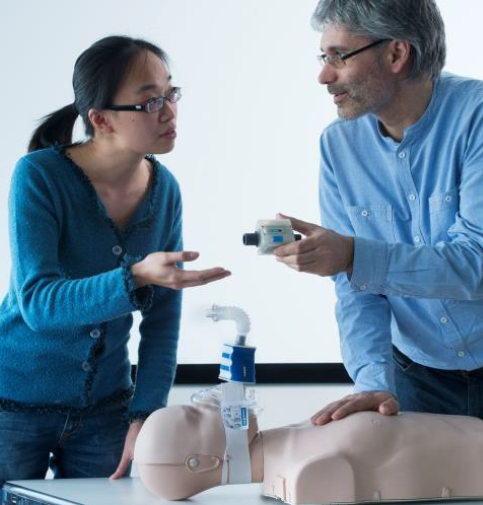 Within the SMARTER-SI project a new type of respiration system will be manufactured that combines electronics as medical device (regulated market) with respiration tubes as disposable (low price!). The manufacturing is a challenge due to the complexity and high miniaturization of the module while considering medical exigencies. The project partners of SMARTER-SI can provide all necessary technologies and building blocks to realise this innovative sensor system with the desired TRL: A temperature sensor (building block by CiS) and MEMS-sensor elements for flow and CO2 (building block by Hahn-Schickard) using assembly technologies by IK4-IKERLAN and Tyndall National Laboratories. The electrical contact system for medical application to connect the disposables is provided as building block by Swerea IVF. The German SME Karl Küfner contributes e.g. housing, tubes and tools for the production of the disposables. The company, as specialist in injection molding technology and biocompatible materials, will also implement the end-user testing and the commercialisation of the final product. For cell and tissue culture, it is important to place the cell in a situation that is close to the in vivo case, therefore an adapted support for cell culture is necessary. 500 nm thick Si3N4 membranes with high density of submicron pores, constitute an excellent cell support with an excellent capacity to transport the cell nutriment through the membrane. The cells have the possibility to interact with the medium on both side, a condition close to the in vivo situation. For testing the effect of compound or situation on different type of cell culture, it is important to monitor the integrity of the cell layer. This can be done by measuring the Trans Epithelial Electric resistance (TEER). The TEER is affected by the condition of the cells and can be monitored. 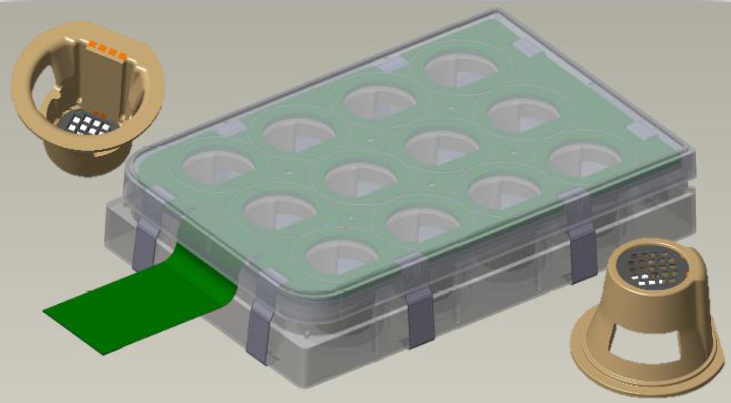 The goal of this project is to develop a smart cell culture insert and multiwell plate for use inside a cell culture incubator using microporous Si3N4 membrane (CSEM building block). 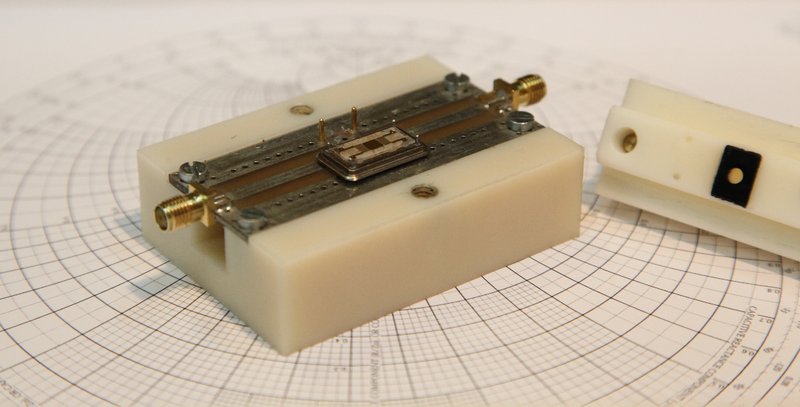 The electrodes for TEER measurement are integrated on the membrane and in the inserts that are connected via an interconnection plate and PCB (Ikerlan building block) towards the electronics that will perform sequentially the TEER measurement on the desired well in an automated fashion (Tyndall building block). The data will be collected automatically and will be available via USB connection for analysis. Two SME partners will benefit directly from the project to a) broaden its portfolio (SIMPLInext) and b) expand its services in complex cell and tissue culture analysis (Vitroscreen). 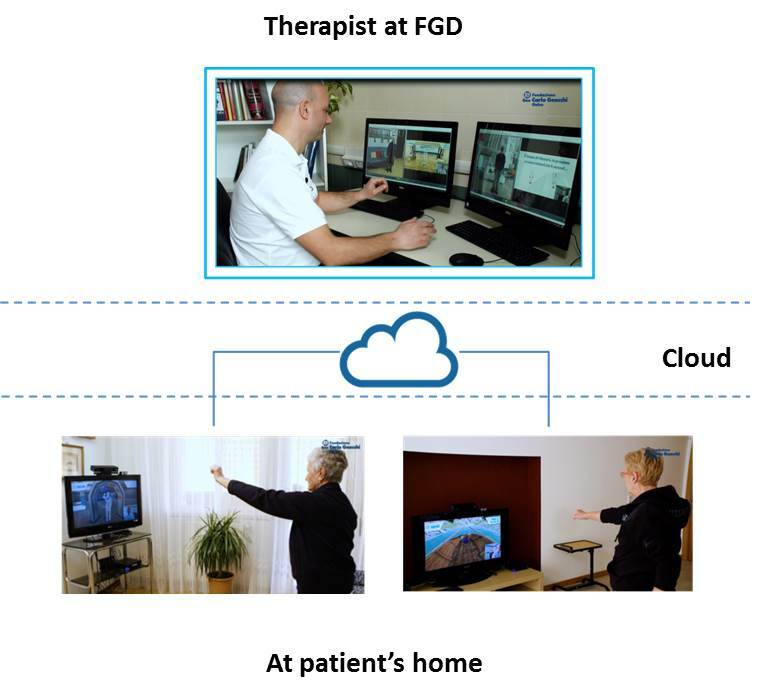 Fondazione Don Gnocchi ONLUS (FDG) is the author of an innovative home-based rehabilitation model which allows treatments delivery by the therapist directly at a patient home in telepresence through audio-video connection from a remote location. The architecture of the Tele-rehabilitation is made up of “Therapist Station”, located at one of FDG Center, and a number of “Patient Stations” to be installed at the assistants’ home (Fig. 1). 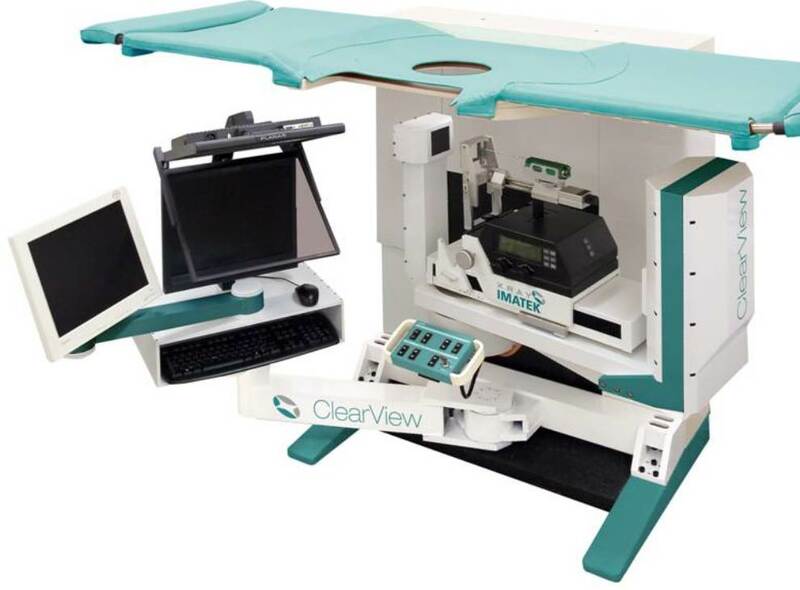 A “Patient Station” consists of a mini-PC with webcam and microphone, and a Kinect sensor for detecting body movement. The PC is pre-installed with a software that proposes the rehabilitation exercises and the one that integrates video communication. The therapist's workstation is made of 2 computers equipped of webcam, microphone and speakers. 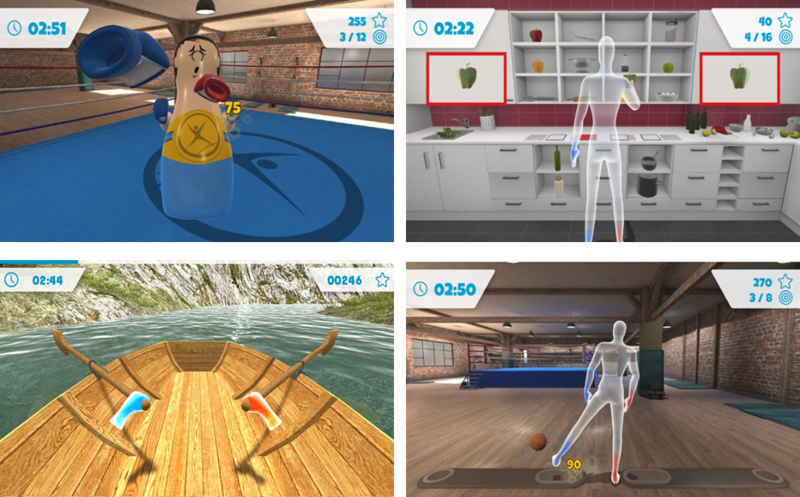 On those 2 PC the software of rehabilitation exercises ensures the creation of a personalised rehabilitation program for each patient (Fig. 2). The therapist can observe both the patient's screen and the patient himself while he carries out the exercises, receiving analytical data and monitoring patient’s vital parameters. This innovative Tele-rehabilitation model, by storing into cloud vital parameters and the data from each exercise, permits to have an objective vision of the rehabilitation treatment itself. This new way of doing rehabilitation gives the possibility to expand the assisted population and reduces the huge waiting lists, guaranteeing care continuity for much more patients with less money involved for the healthcare system. The increase of the efficiency is optimised even more by the fact that remote treatments can be provided from one to many simultaneously. This project involves a strong collaboration between SMEs, large industries and FDG which ensured the customisation of the already commercially available software in order to accomplish a solution that would meet the needs of end users balancing efficacy and sustainability. The innovative concept of telepresence during each home-based rehabilitation session is what makes possible the reimbursement from the regional healthcare representatives. The subretinal implant RETINA IMPLANT Alpha AMS is able to replace the functionality of the degenerated photoreceptors to a limited degree by way of electrical stimulation of the outer retinal tissue. As a result, information can be transmitted to the visual cortex of the brain through the optic nerve, thus generating visual images. The chip is only 3.2 x 4 mm in size with a height of 70 µm. It is equipped with 1600 photodiodes, which convert the incident light into an electrical signal. This signal is amplified and relayed via electrodes to the retinal signal processing layers which are still functional. From there, the signal follows the natural optical path through the optic nerve into the area of the brain (visual cortex), where the incoming information is interpreted and visual images are produced. By placing the implant under the retina, the patient is able to make use of their natural eye movements to see. A special camera for taking pictures outside the eye is not required. 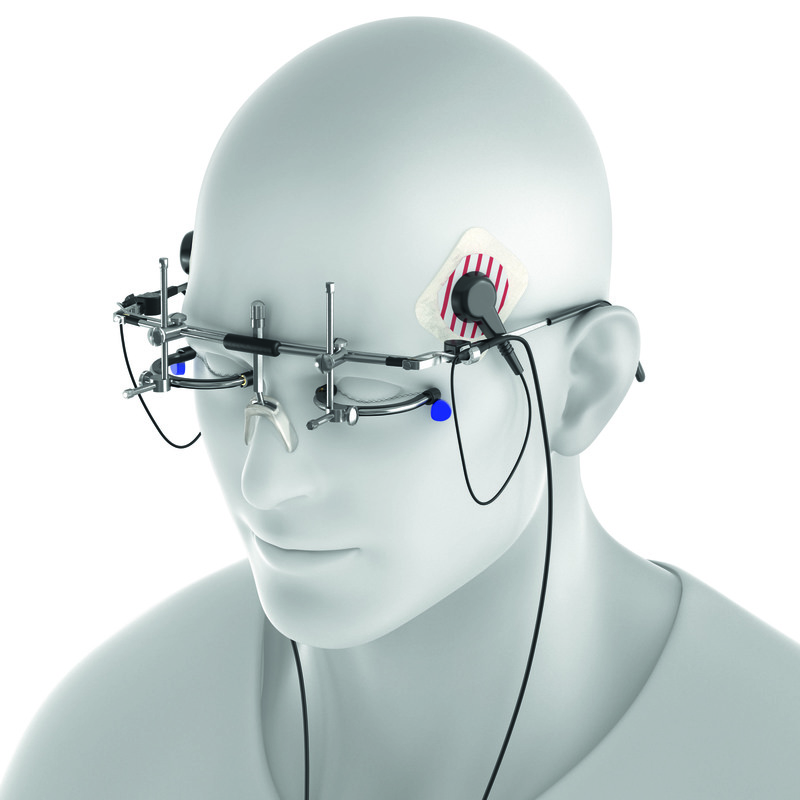 The components of the RETINA IMPLANT Alpha AMS implanted in the eye rely on an external power supply. The compact handheld device (15 cm x 9.2 cm x 2.8 cm) contains batteries and an electronic circuit that generates a magnetic alternating field in the transmitting coil (transponder D). It can easily be carried in a pocket. Consequently, energy is transmitted via induction through the skin to the receptor implanted behind the ear in the cranial bone, as long as the transmitting coil is magnetically coupled to the receiver coil. The current generated in the receiver coil is fed to the eyeball via a cable running under the skin to the temple. The current is passed through a thin conductor strip through the eye wall (sclera) to the microchip under the retina. The microchip can then be switched on and operated. No external or artificial image processing is required à every PIXEL works alone and independently. Approx. 30.000 to 40.000 people are affected by Retinitis pigmentosa (a hereditary retinal degeneration disorder) in Germany. A small percentage of these people have gone blind due to those types of eye diseases. 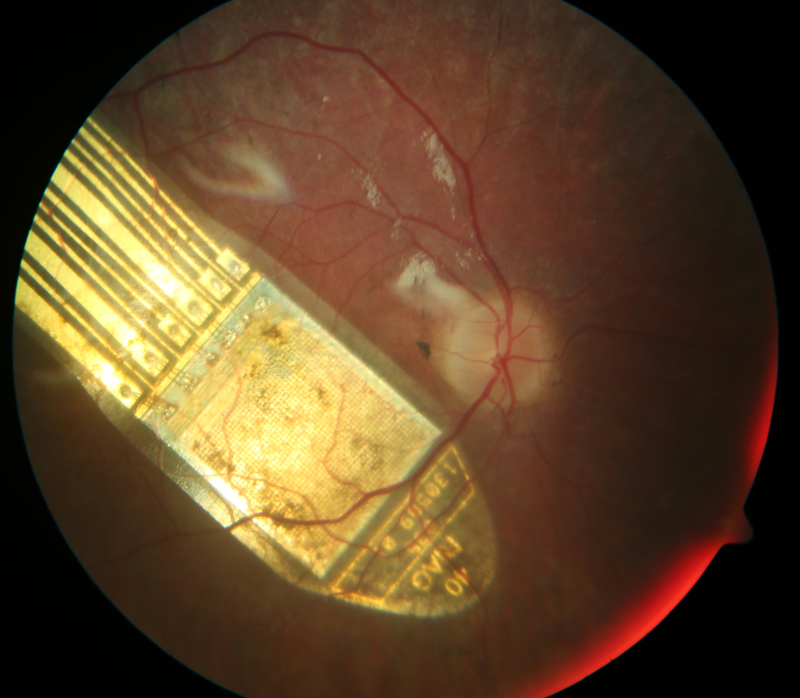 With the chip they have the opportunity to have restored a low, but useful vision Since 2005, the current chip and the predecessor model have been implanted in over 60 patients mostly in Europe. A consortium of different academic groups (like the University Eye Clinic in Tübingen, Germany) and research institutions (like the Naturwissenschaftliches und Medizinisches Institut (NMI) and Multi Channel Systems (MCS), which are both located in Reutlingen, Germany) managed to deliver the complex basic research – mainly enabled by federal and country-level research funds. Since 2003, business angels provided the necessary funding for the development of prototypes, clinical trials and certification in the company Retina Implant AG. The Multi-Organ-Chip (MOC) technology is an alternative to animal testing in pharmaceutical, cosmetics and chemical industry. 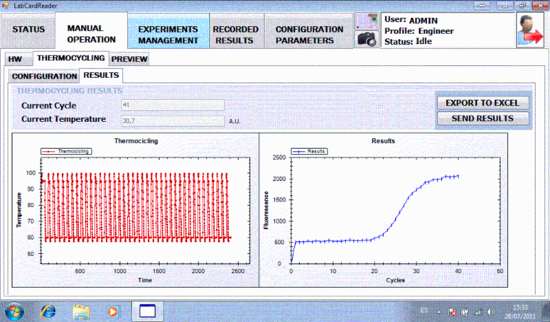 A critical performance criterion is the ability to measure in-process controls online. Currently daily sampling is done manually. All parameters of interest are measured separately which is time consuming and does not express the full value of the MOC concept. The ability to measure critical process parameters online and in parallel is a crucial step towards a fully automated Multi-Organ-Chip system. 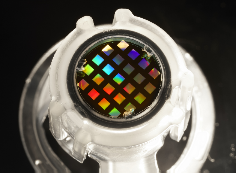 This would allow for faster predictions of responses of the Multi-Organ-Chip systems to the exposure of drug compounds/cosmetic ingredients/chemicals. TissUse is a German company providing high-value services and products in the area of tissue culture analysis of drug candidates, cosmetics, chemicals and consumer products. Based on its proprietary technology platform, TissUse develops and commercializes Multi-Organ-Chips. The company is the first on the market to provide such solution. The project between CSEM and TissUse in the scope of the gateone-project is dedicated to support the company in the evolution from a serial to a parallel analysis process required for the use of TissUse platform. The gateone-project provides a unique framework of cooperation between the German SME and the Swiss Research and Technology Organisation. Moreover, one of the mission of the gateone-project is to lower the adoption barrier of bio related technologies thanks to smart systems, and the partnership with CSEM will further contribute to the value proposition of the existing platform by demonstrating the benefits of process automation. The open innovation framework provided by the Smart Anything Everywhere initiative is ideally suited for sharing the risk and build a strong base for a future partnership. The project is very promising and addresses a strong market need to optimize pharma drug discovery process with better ROI. It could also contribute to the development of know-how and competencies in Europe to drive regenerative therapies in the future. TissUse presents a strong differentiation and gateone-project through CSEM could support a major technical achievement for the company to reinforce its market penetration and support the growth of the MOC market. Major pharmaceutical and cosmetics companies are expressing interest in such solution. The process parallelisation to be developed in the scope of Smart Anything Everywhere will have a major impact to demonstrate the feasibility and benefits for automation for today and future MOC users. RI OkuStim is one of the very first outpatient therapies for retinitis pigmentosa (RP), and its efficacy has been demonstrated in clinical trials. 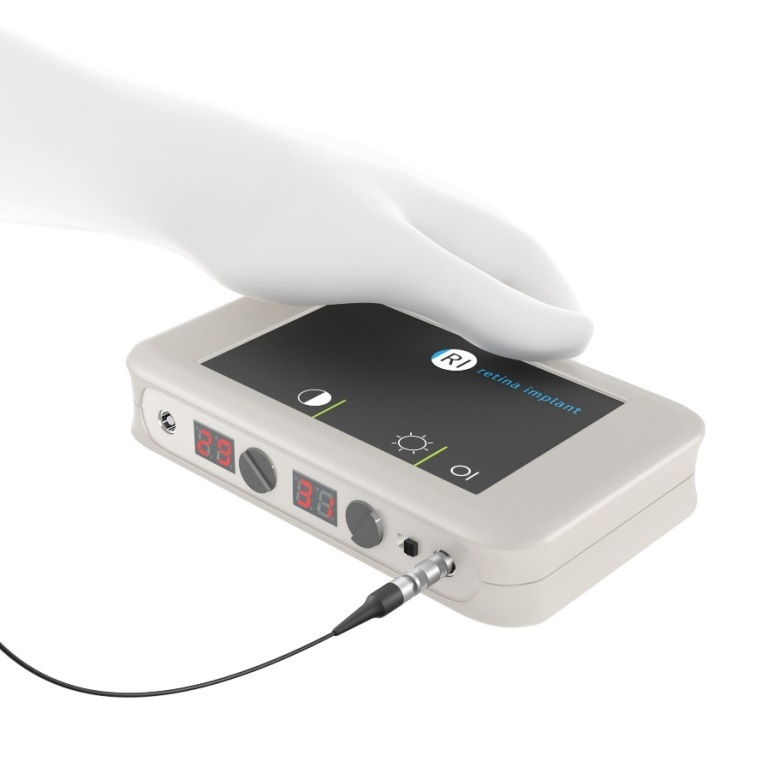 The transcorneal electrical stimulation therapy with the RI OkuStim system offers patients with RP the chance to slow down the course of the disease. Studies show that it is possible to activate several so-called neuroprotective growth factors and thus create a cell-retention effect in the retina. This contributes to enabling longer cellular function of the remaining cells which, for example, can be measured by an electroretinography (ERG). This represents the electrical activity of the cells in response to light stimuli. Therapy can be performed independently at home after the doctor has set the individual treatment parameters and the patient has been sufficiently instructed by a doctor. The patient’s eyes are stimulated by means of electrodes with a weak electrical current via the RI OkuStim device. RI OkuEl single-use electrodes are extremely thin 100 μm electrode filaments placed on the surface of the eye below the pupil. The electrodes are clipped into the RI OkuSpex frame so that a visually impaired patient can perform the therapy session by himself at home. 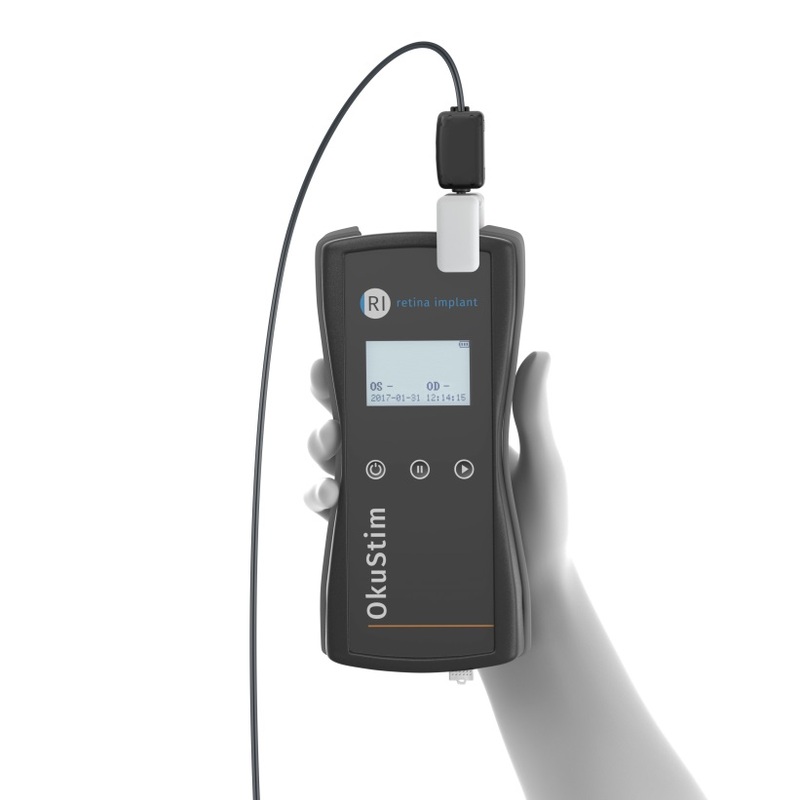 The RI OkuStim device has a sound output in addition to a display so that it may also be used by those with visual limitations. RI OkuStim is one of the very first outpatient therapies for RP, and its efficacy has been demonstrated in clinical trials. With RI OkuStim RP patients have a therapy option which is considered safe by a panel of experts consisting of doctors and representatives from the patient organisation PRO RETINA on the basis of current studies. The RI OkuStim system was developed as a joint project of the subsidiary company Okuvision GmbH, the Naturwissenschaftliches und Medizinisches Institut (NMI) and Multi Channel Systems (MCS), which are all located in Reutlingen, Germany. Hybrid pixel detector modules based on photon counting technology by X-Ray Imatek, Spain, provide the state-of-the-art in X-ray imaging. The combination of semiconductor materials for radiation detection (e.g. Si, CdTe) with high density bump bonding and submicron low power CMOS electronics have made it possible to integrate powerful and high quality sensor systems. The approach leverages on silicon as sensing material, silicon microelectronics for the CMOS readout chip fabrication, and silicon microtechnology for the fabrication of the detector array chip and also for the integration of both in a single unit. Internal smartness is provided by the CMOS chip, especially the photon counting feature, which allows to virtually eliminate electronic noise enabling higher contrast with a smaller radiation dose. 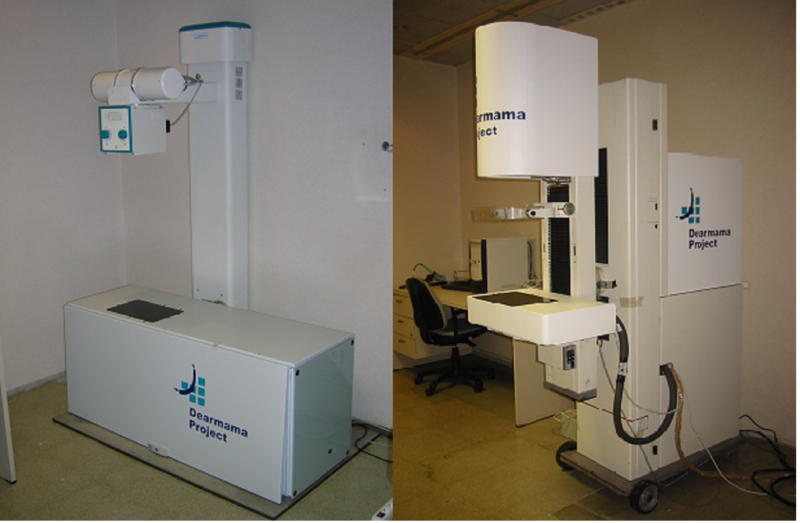 The digital mammography system applies an arrangement of 7x8 modules to cover an image area of 18x24 cm². Extra smartness is provided by the control system and acquisition software that governs the multi-shot approach and image stitching. The complete image is acquired in 1.5 s and presented in 20 s.
Conventional image acquisition is based on radiographic film, but it does require 50 times higher radiation doses. Other digital approaches rely on scintillating layers that convert X-rays into visible radiation which is then captured by a CCD. Lack of efficiency of this indirect conversion and lack of directivity of the visible re-emission require larger doses and avoid exploiting to its full extent the higher resolution of CCDs. The digital system for stereotaxic biopsies employs two compact sets of generation, detection, and processing of X-rays and was developed as a 3D guiding technique for the acquisition of biopsical samples. Each detection set is made of 4x4 chips covering an image area of 6x6 cm². Conventional stereotaxic systems work on sets of snapshots to avoid overdose. They are needed to check, from time to time, the position of the surgical device and to reassess the target position due to displacements produced by the insertion process. 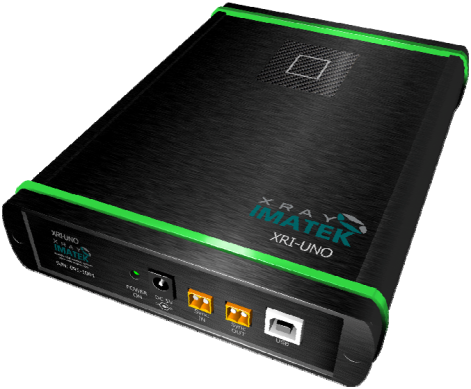 The compact real time X-ray imager designed for research and educational applications employs a single detector chip with high speed video capability. Another promising application of this device is the fast diagnosis of biopsy tissues, untreated or pre-treated with contrast agents. National: National funds were leveraged for the creation of Xray-Imatek as a spin-off and further development projects with company/hospital involvement.